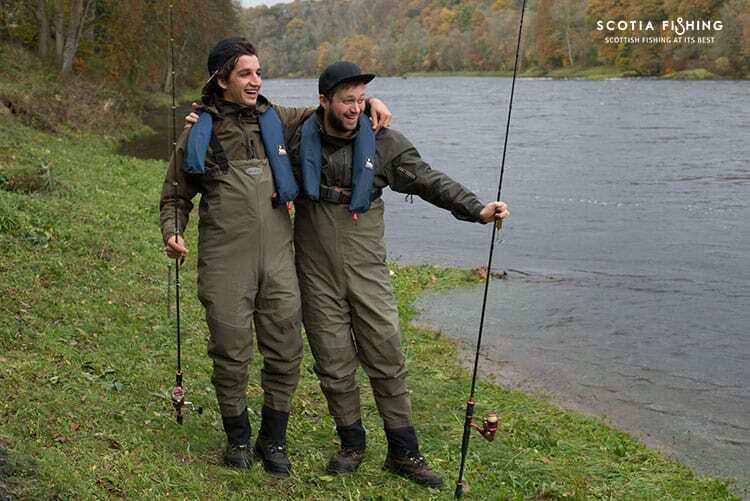 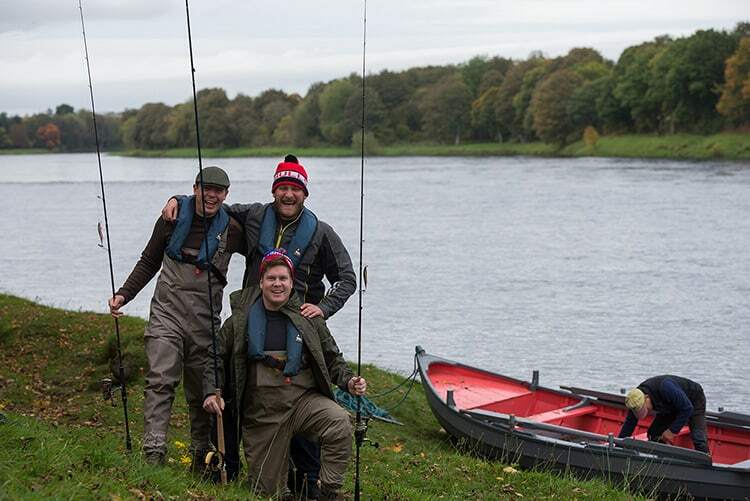 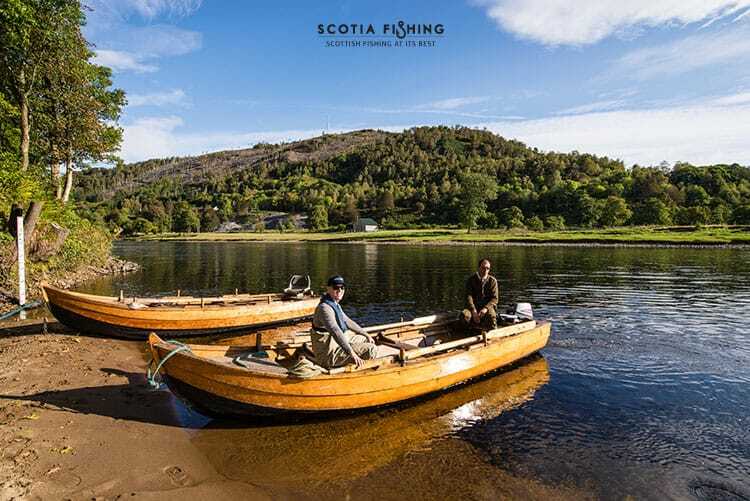 must-do fishing experience in Scotland! 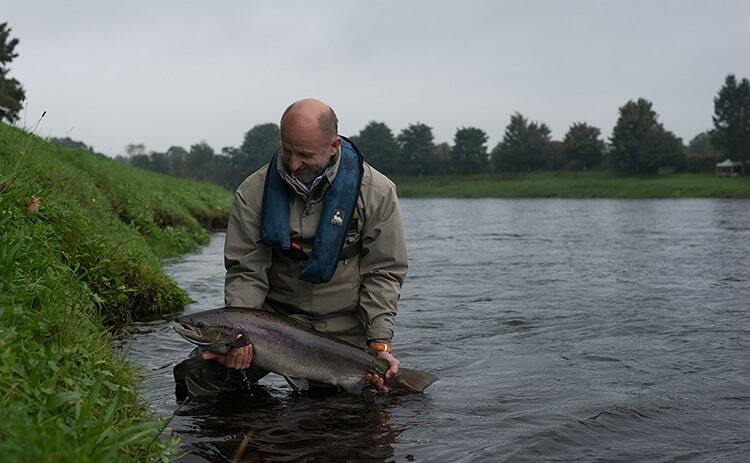 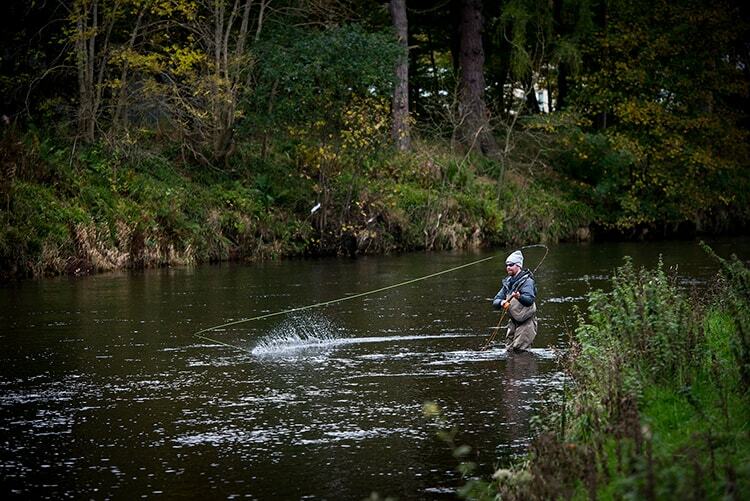 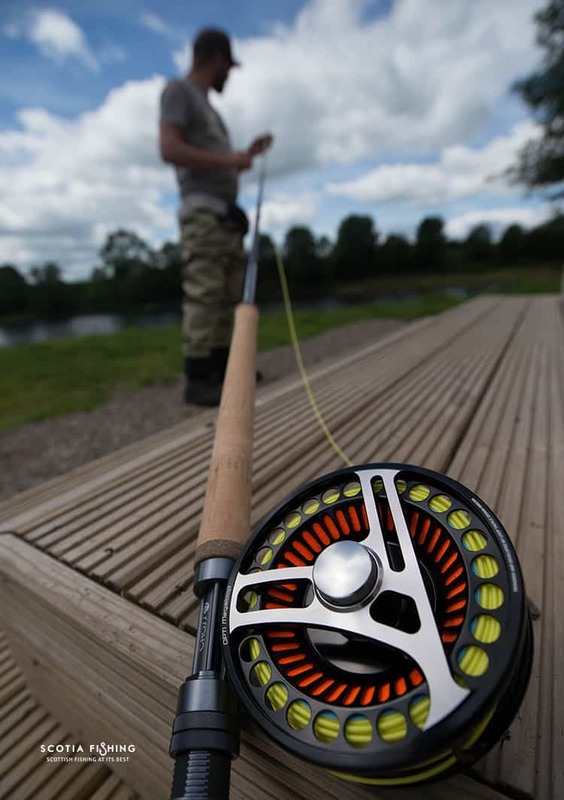 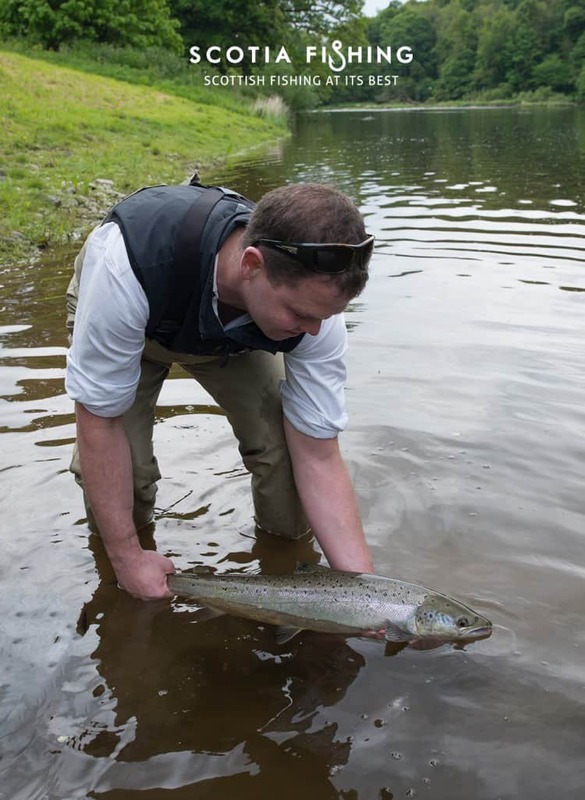 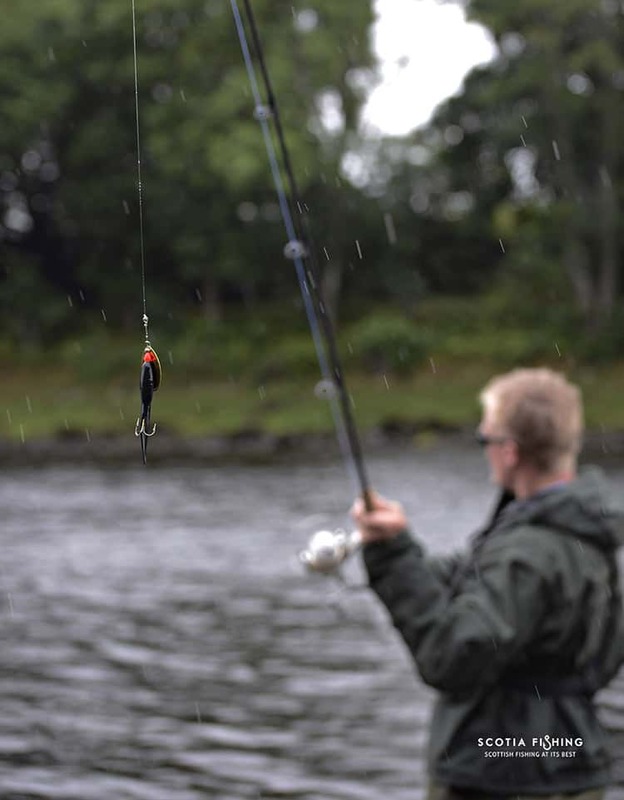 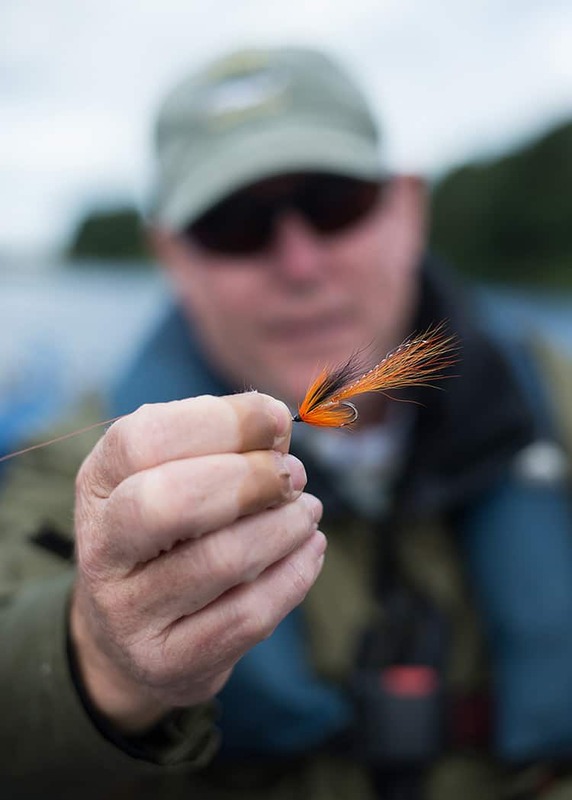 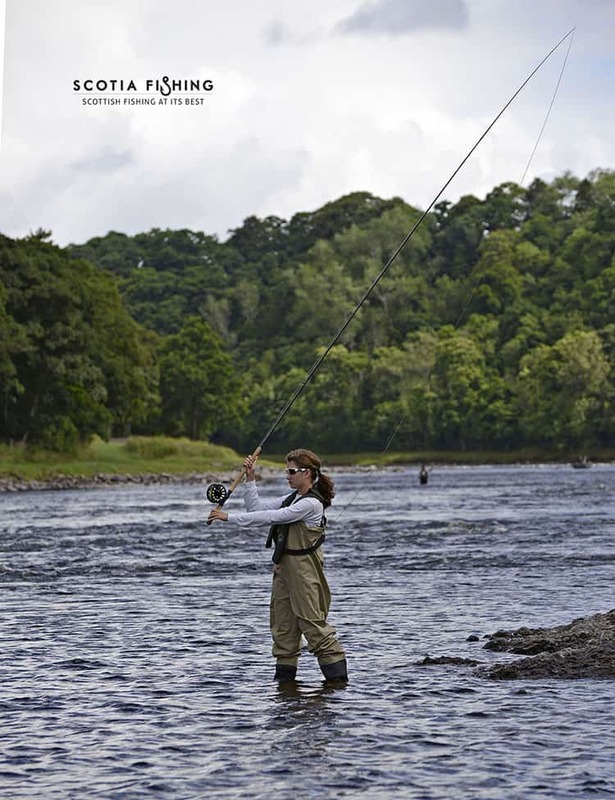 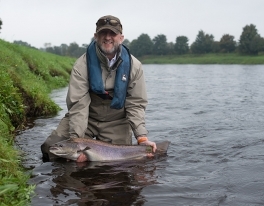 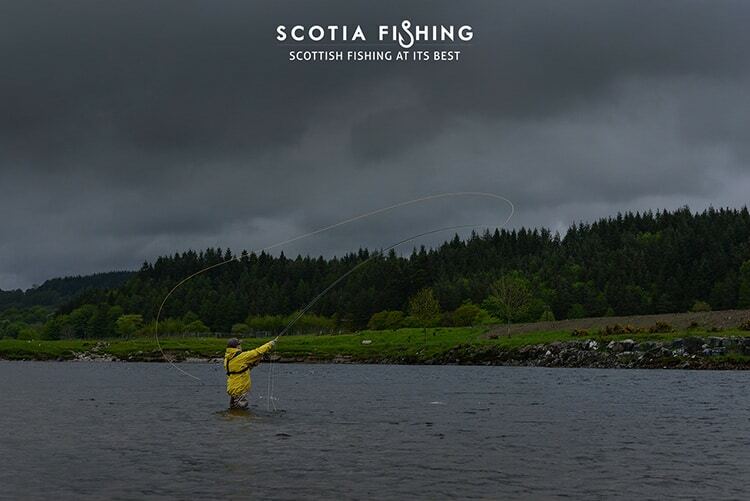 Salmon fishing in Scotland is at the top of most anglers bucket lists. 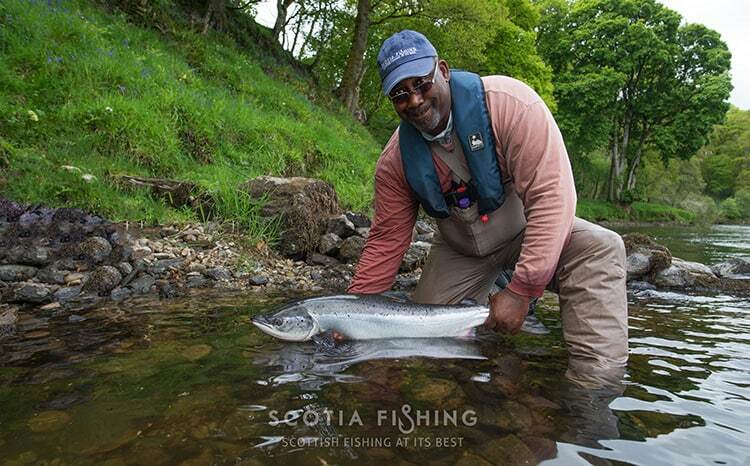 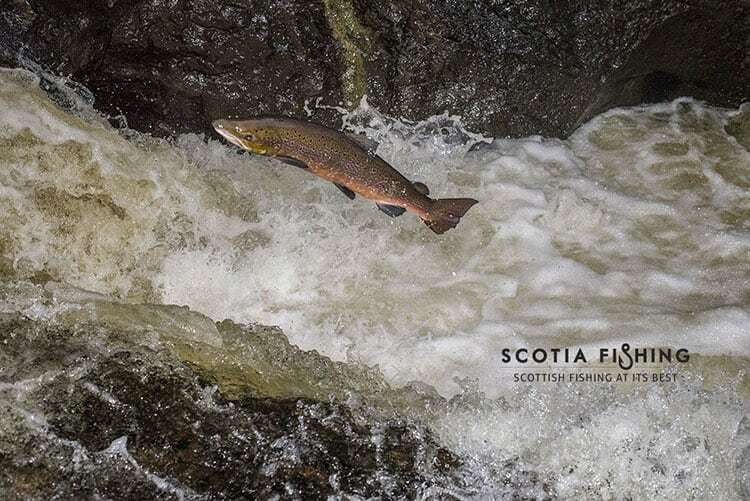 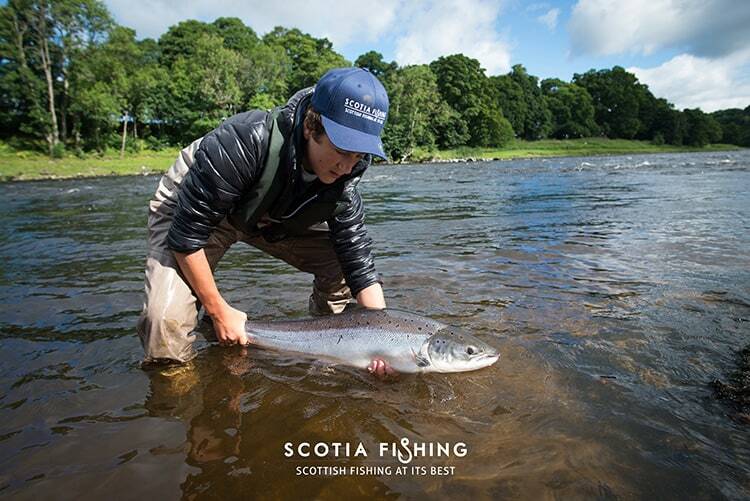 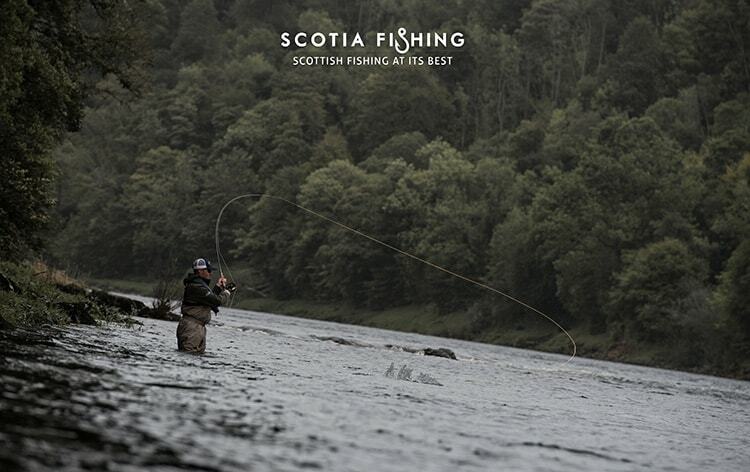 Scotland is simply synonymous with Atlantic Salmon Fishing. 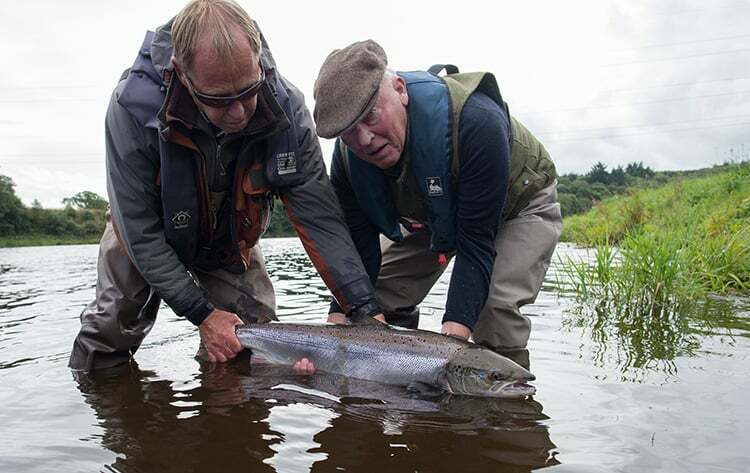 It is still the place all true Salmon anglers dream of catching that ‘bar of silver’. 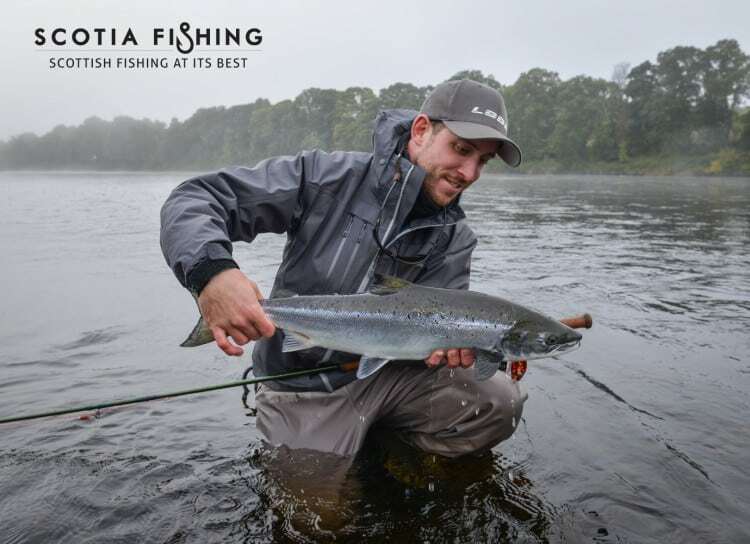 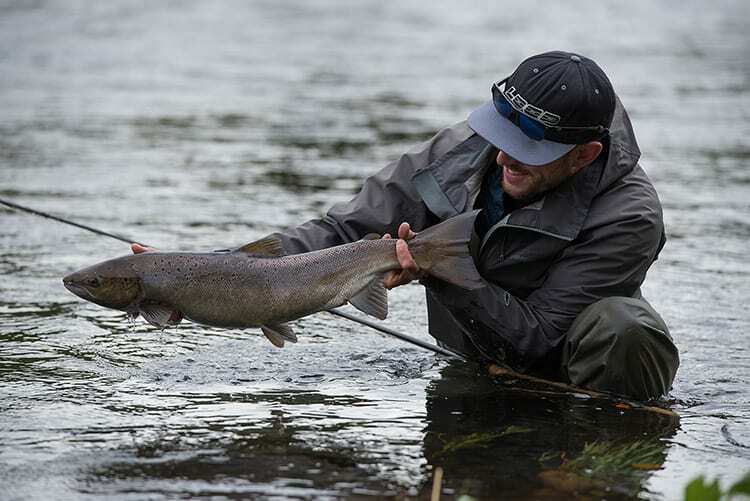 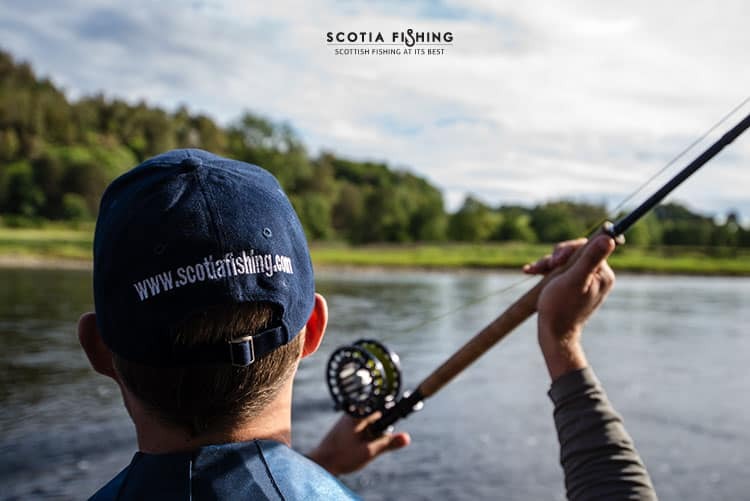 We can make your dreams come true with our Salmon Fishing in Scotland packages, with the opportunity to fish some of the most famous and prolific Atlantic Salmon fishing rivers in Scotland. 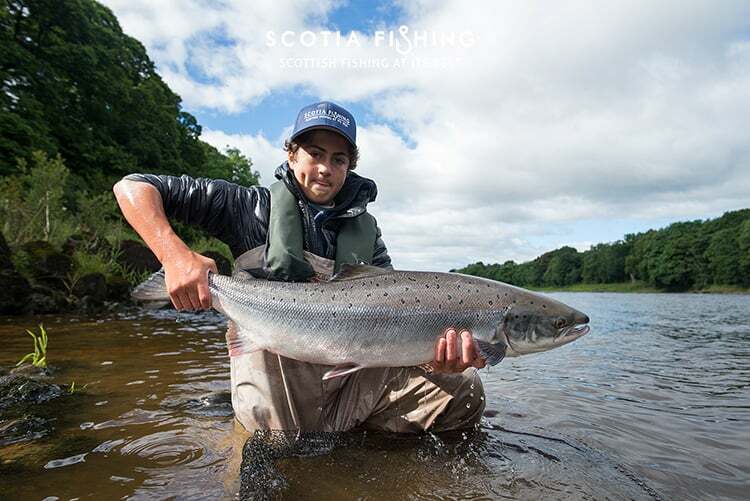 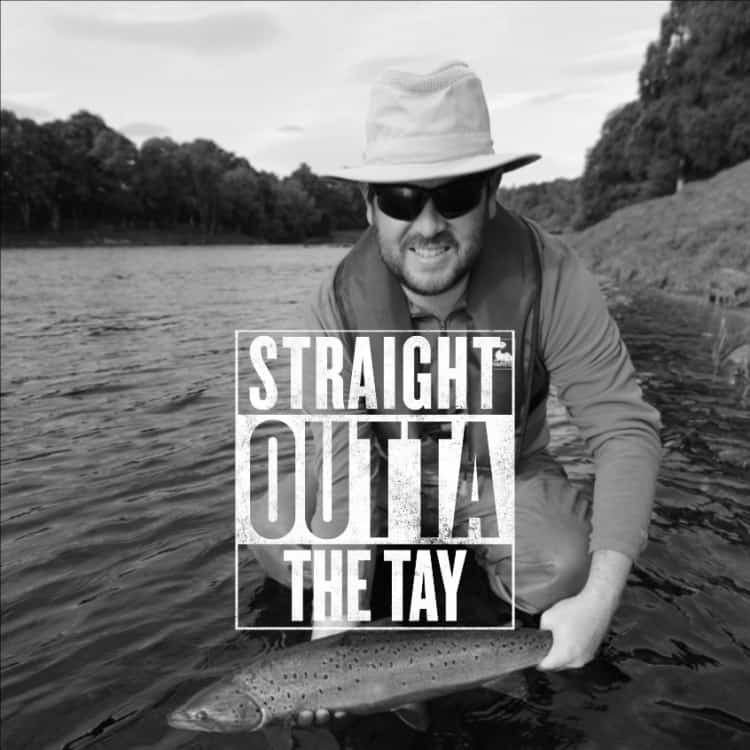 We can arrange Atlantic Salmon fishing in Scotland on River Tay, River Tweed and River Teith and their productive tributaries. 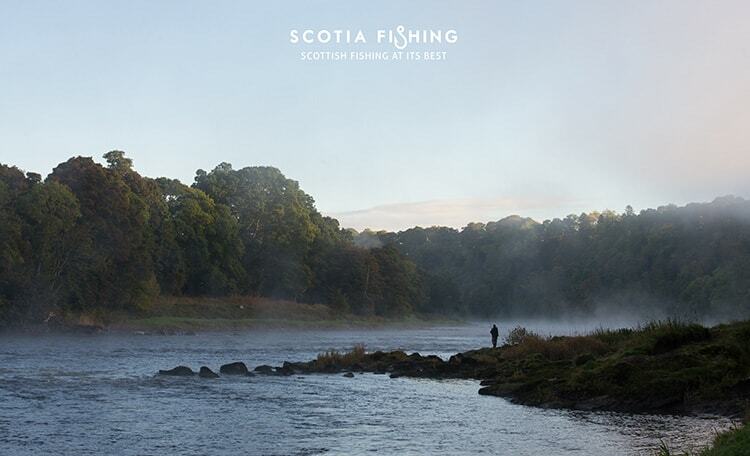 Or some of Scotland’s less known hidden gems. 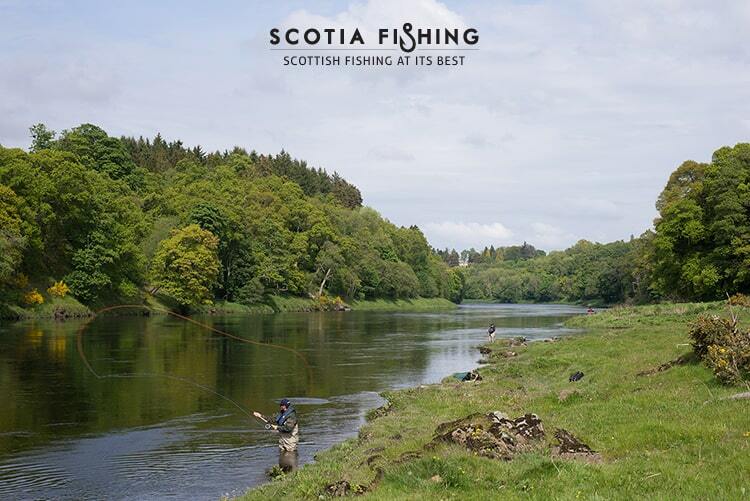 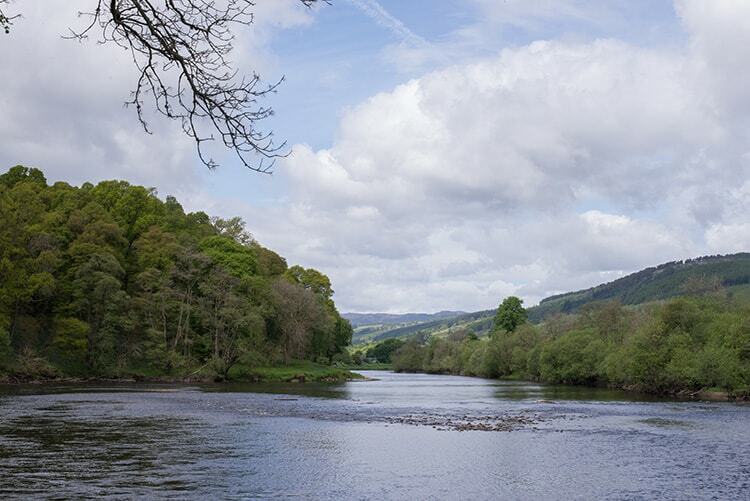 Perfect Day on the River Tay from Scotia Fishing on Vimeo. 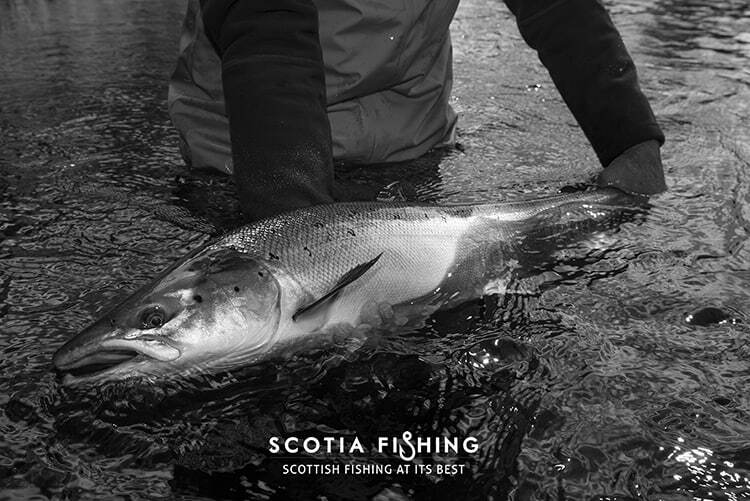 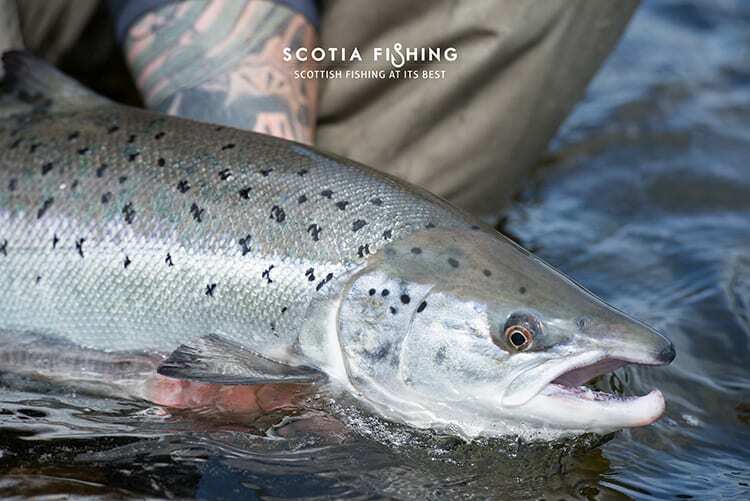 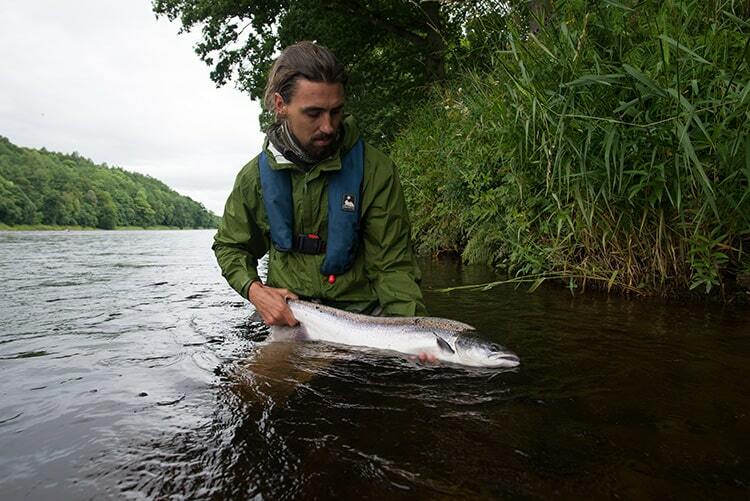 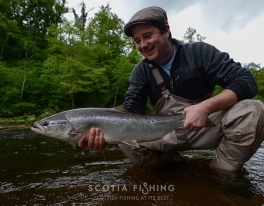 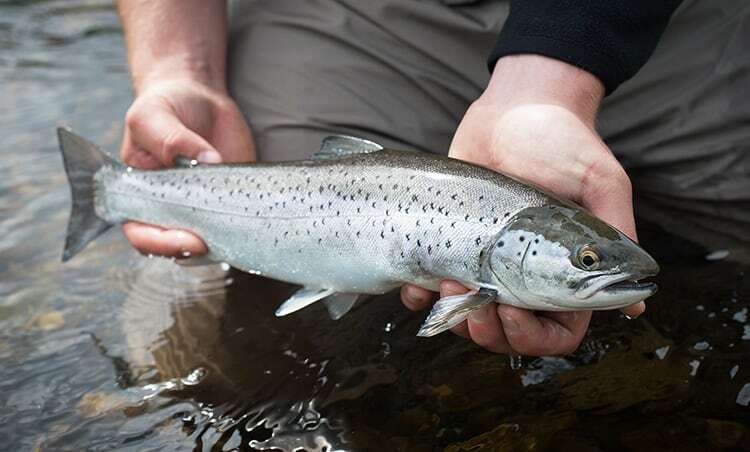 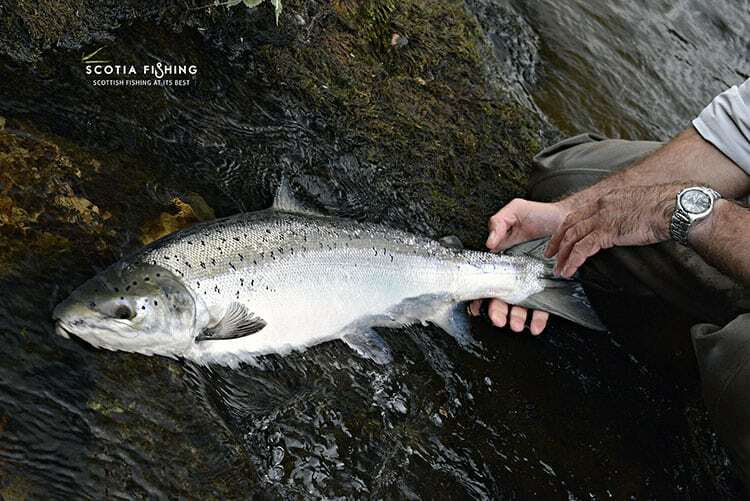 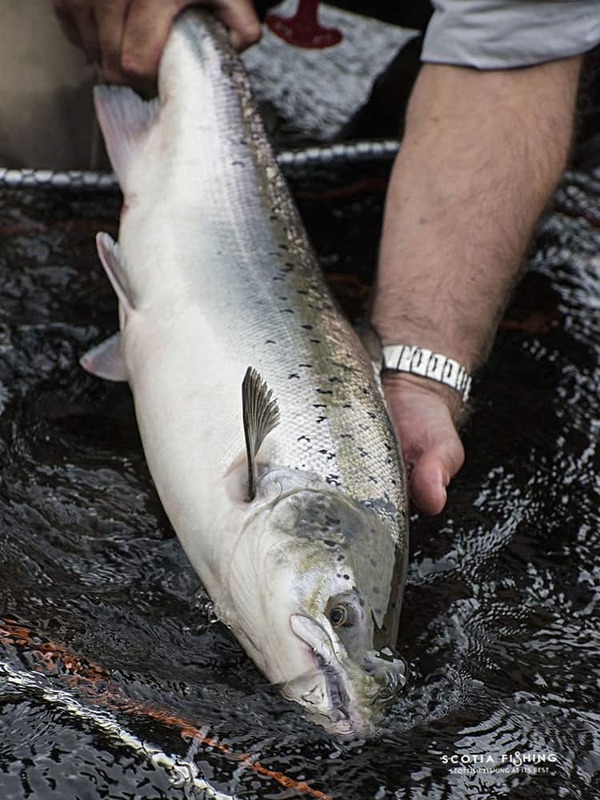 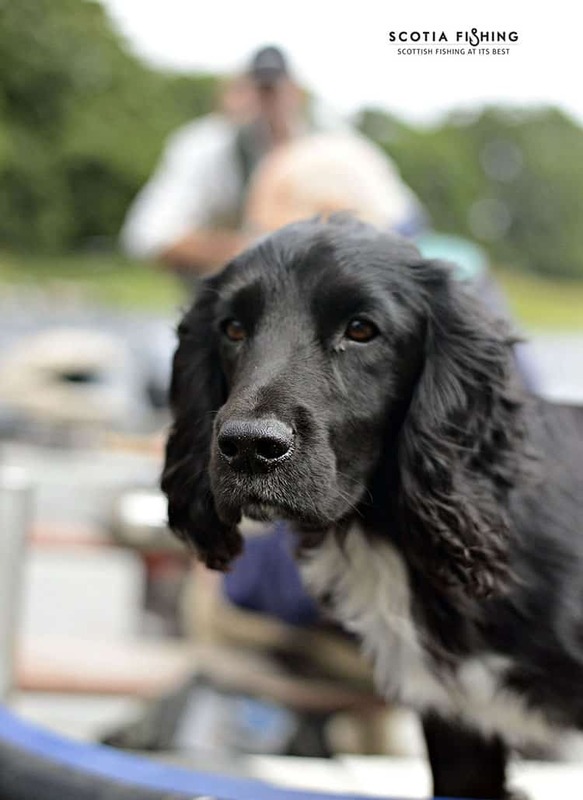 Atlantic Salmon fishing in Scotland is steeped in years of history and tradition. 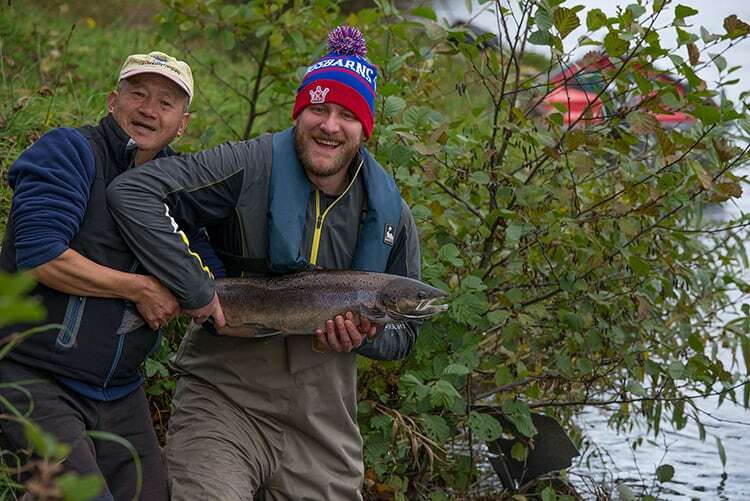 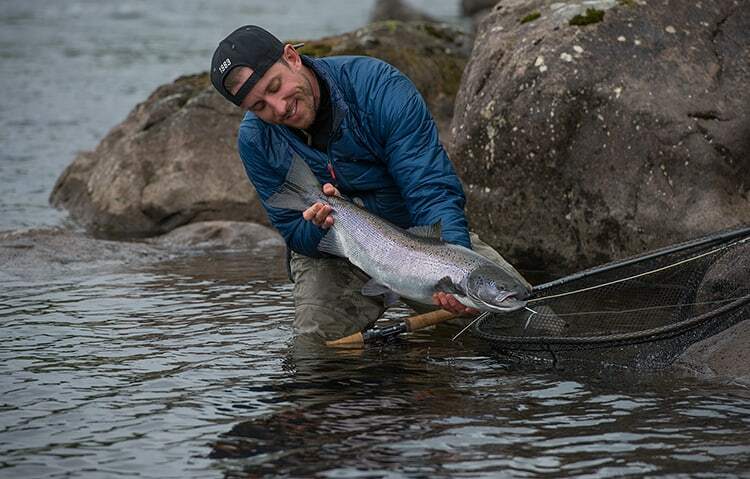 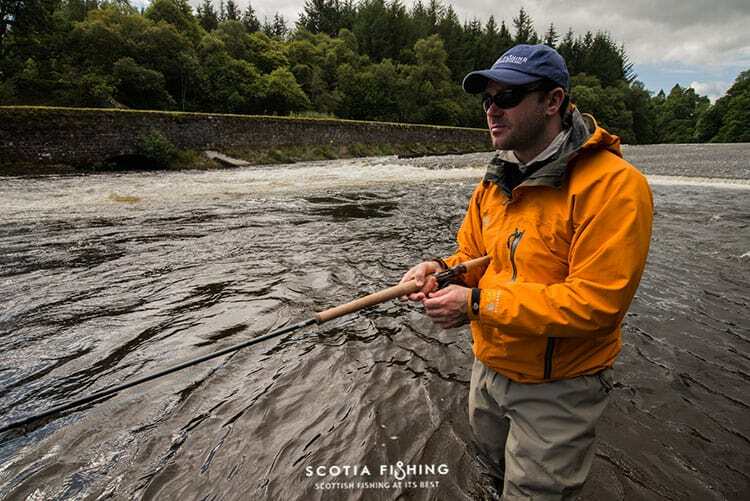 A day Salmon fishing with our trained guides is an unforgettable experience. 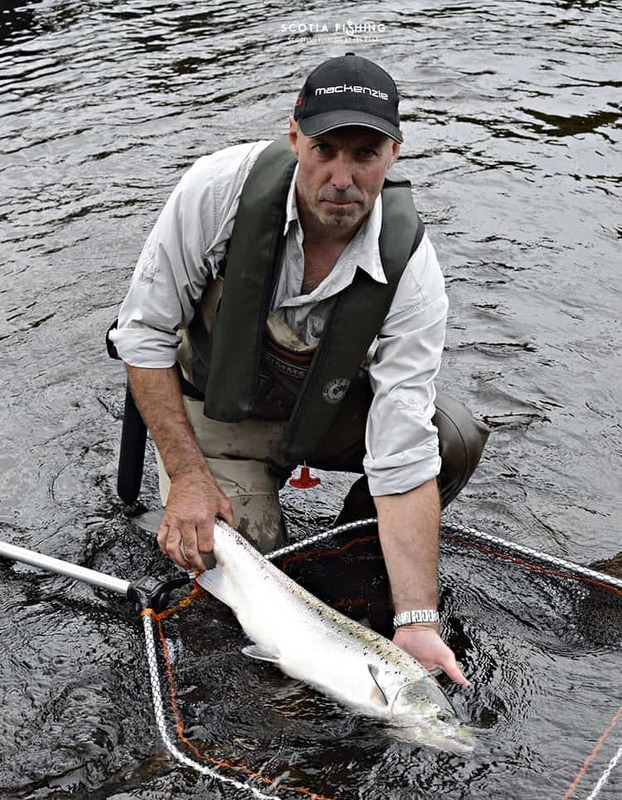 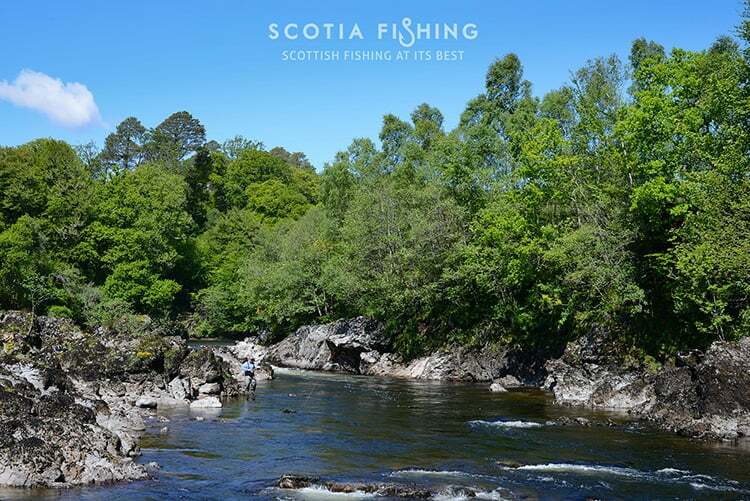 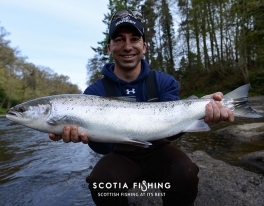 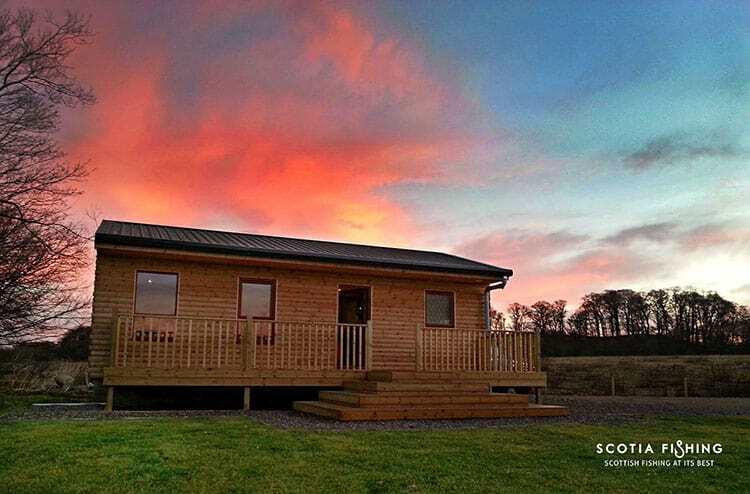 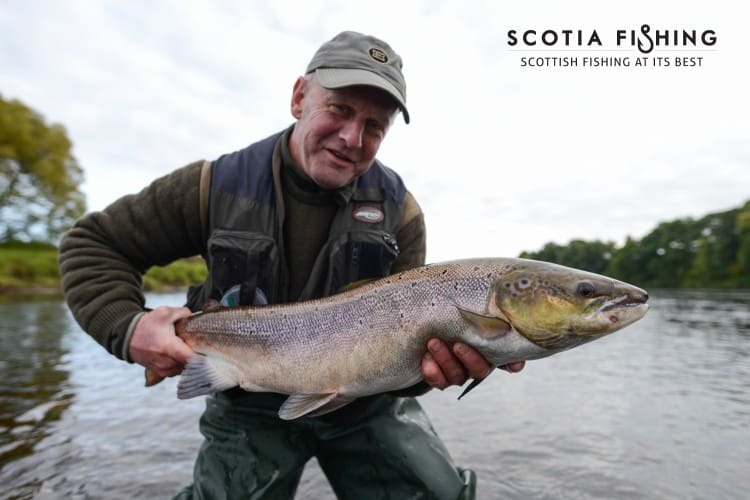 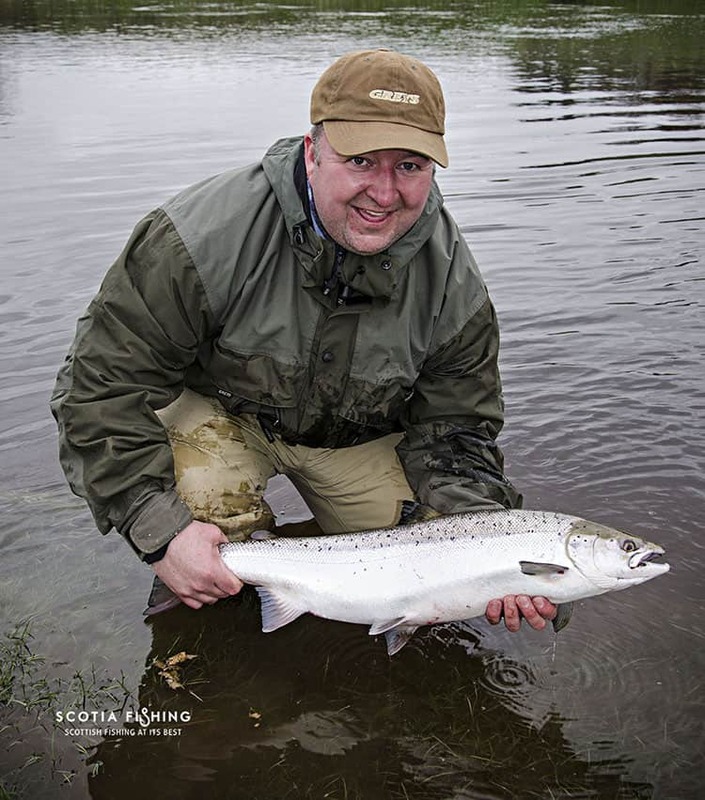 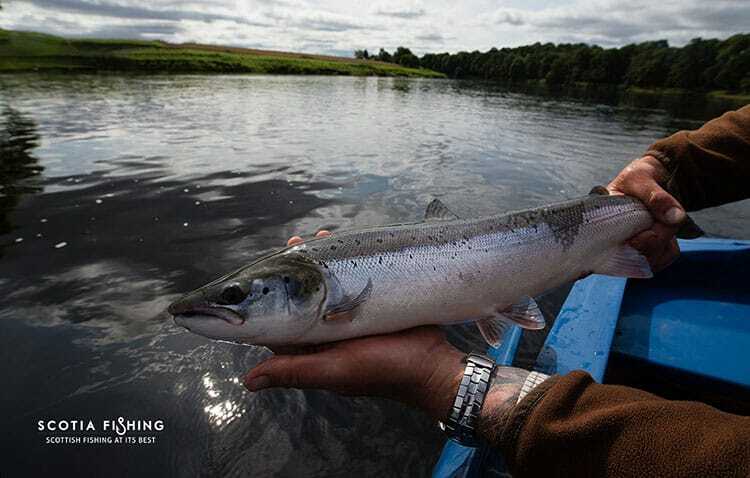 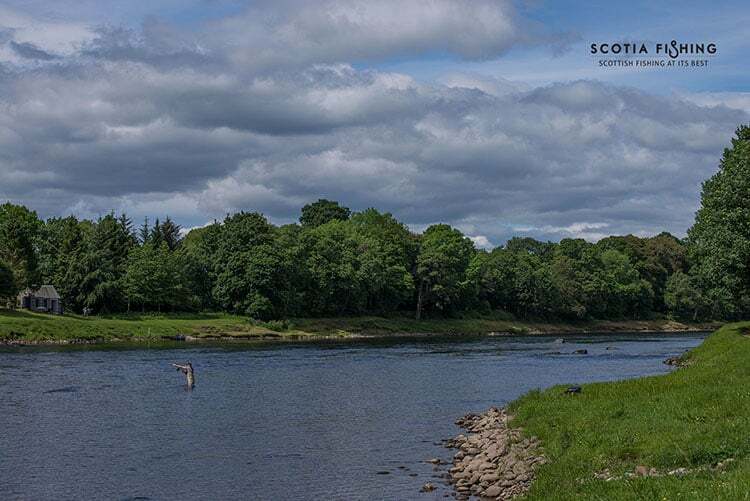 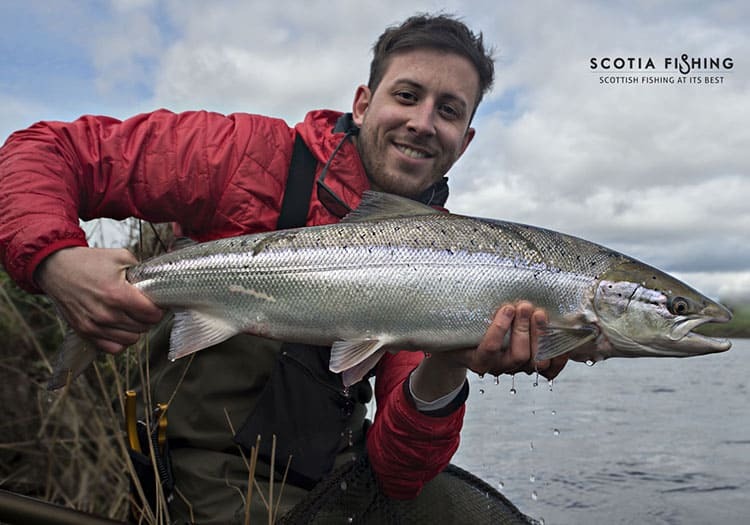 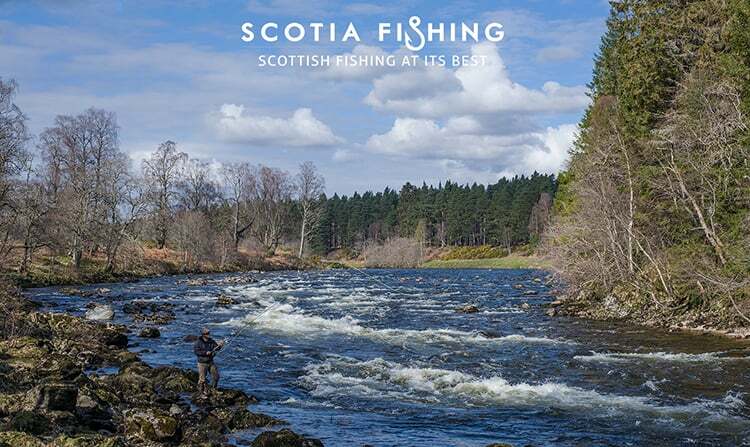 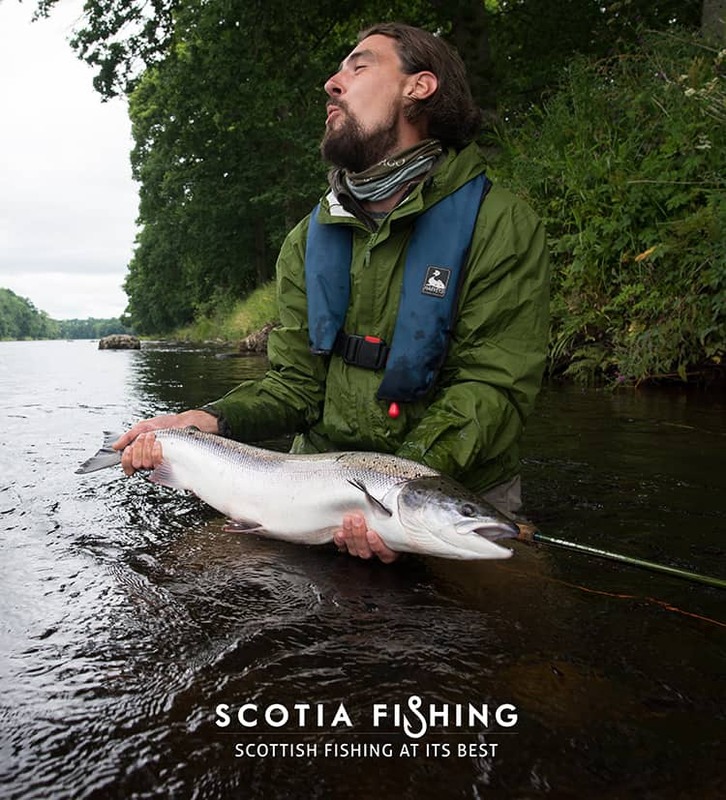 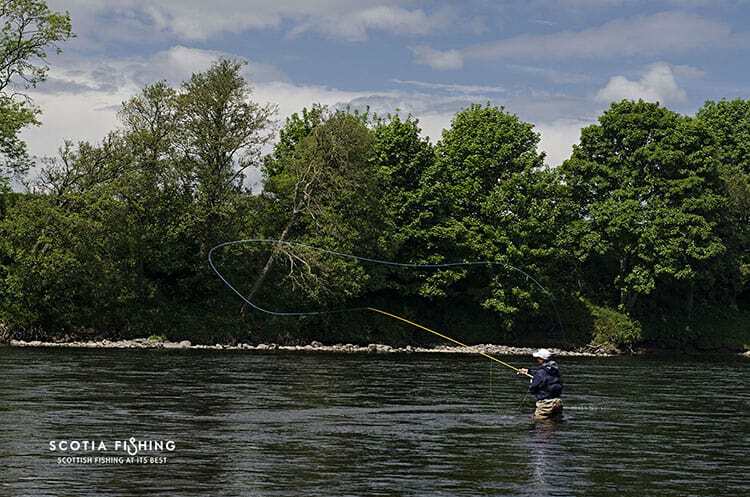 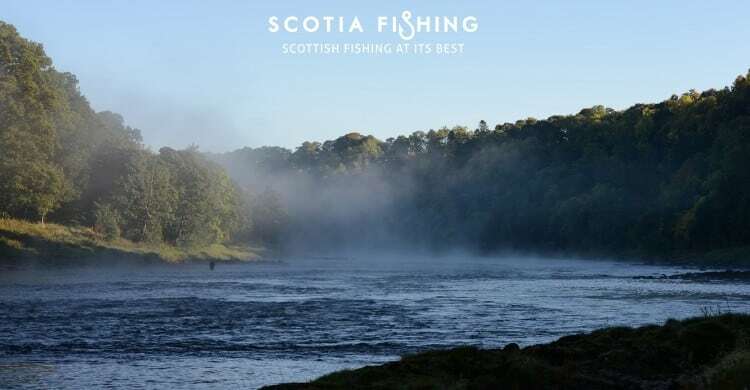 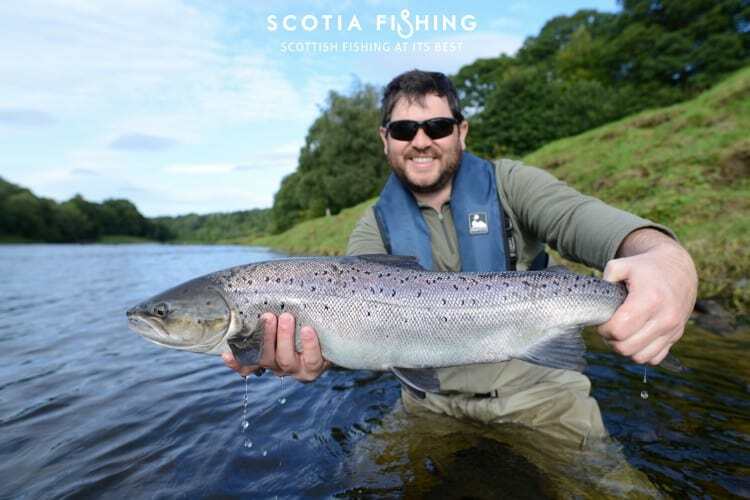 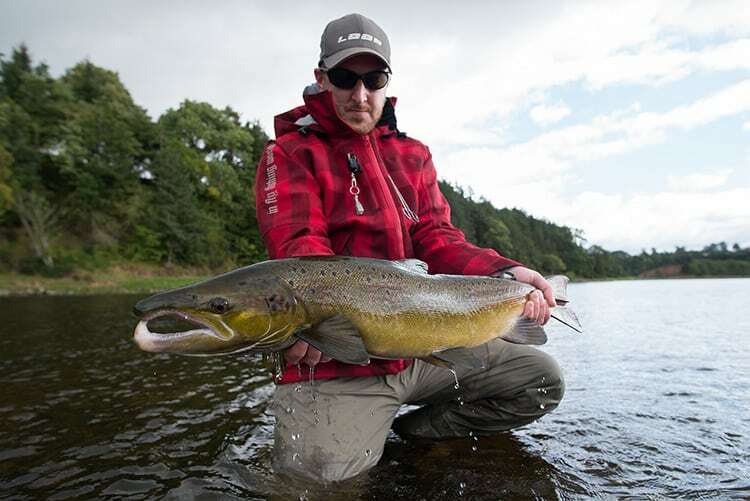 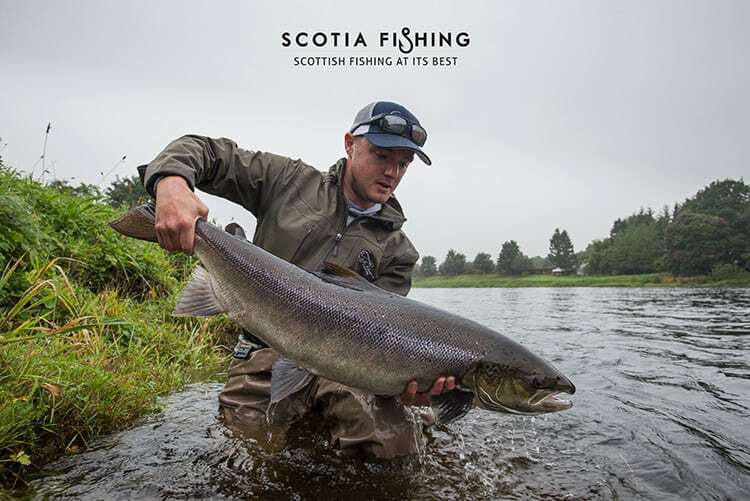 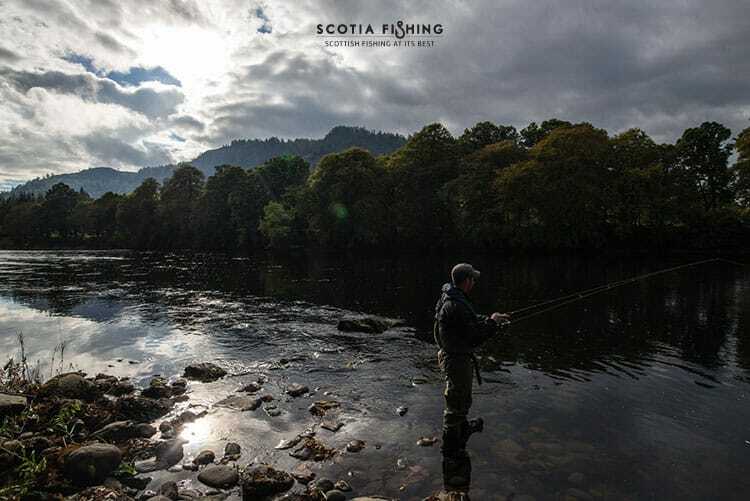 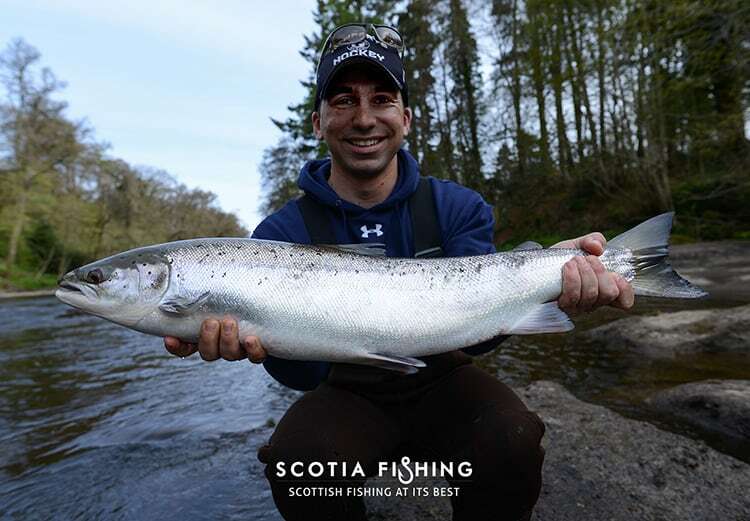 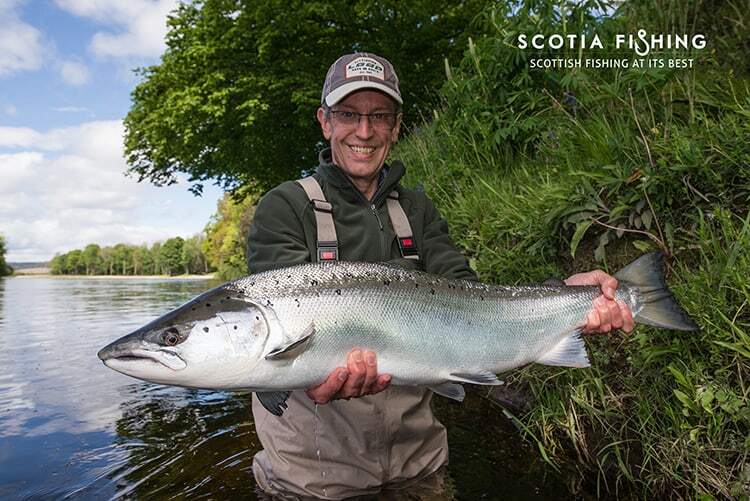 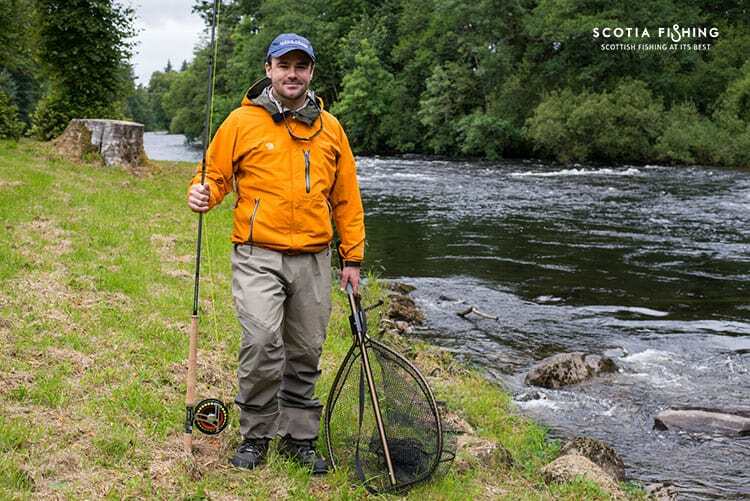 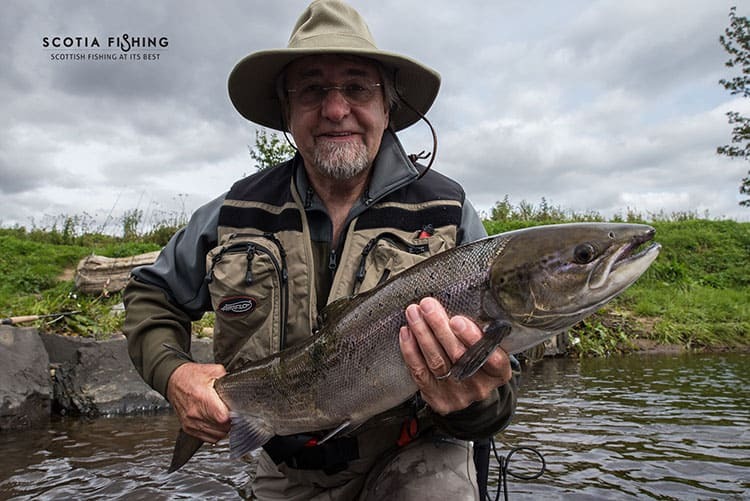 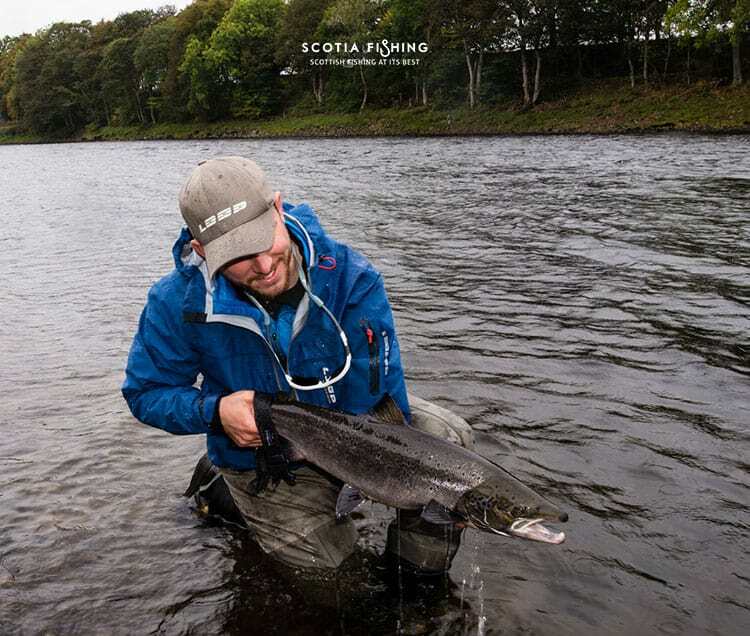 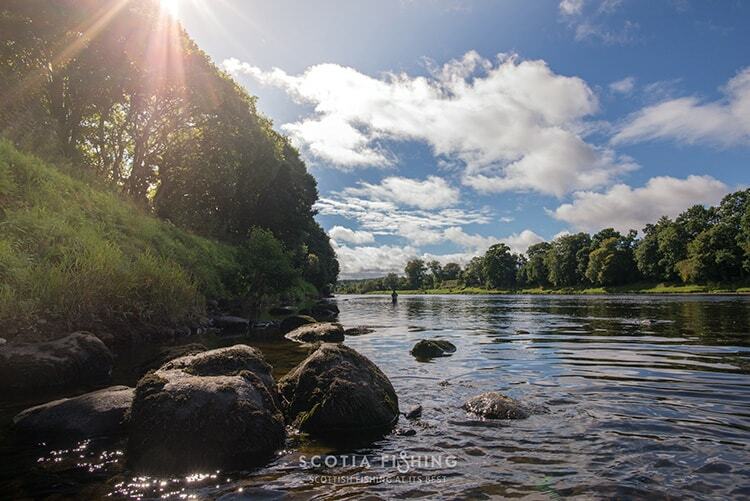 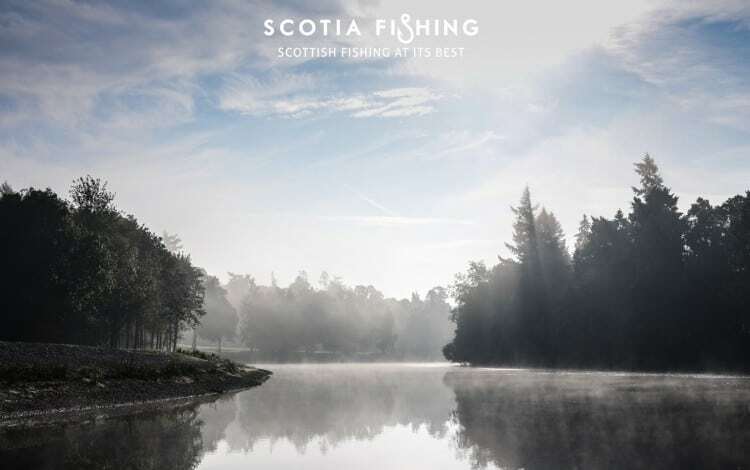 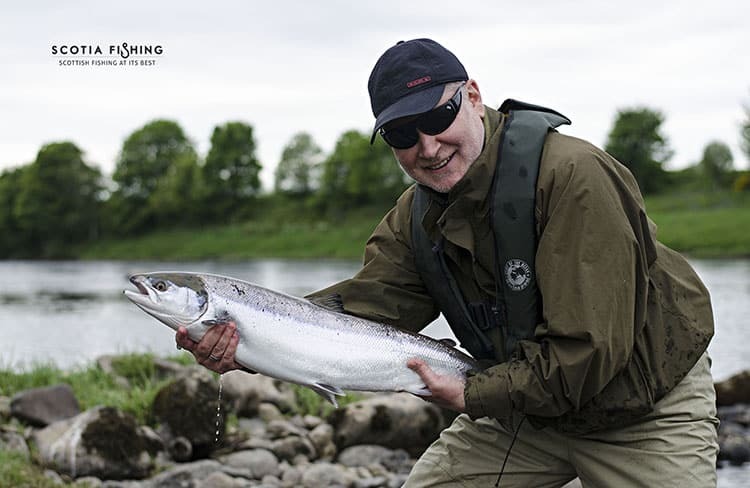 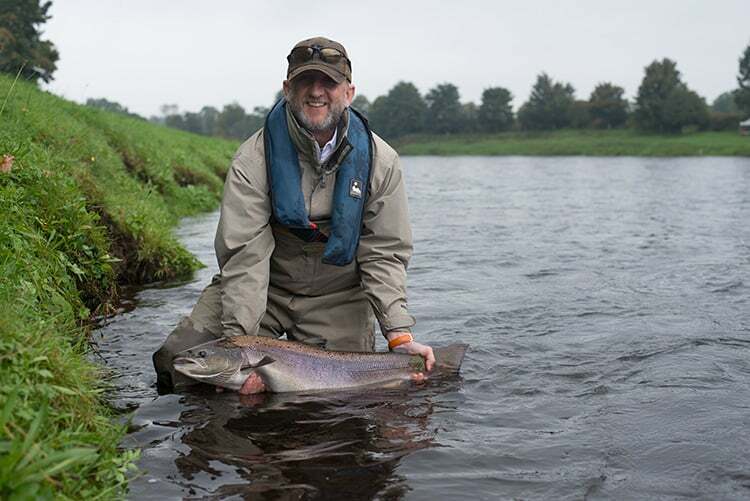 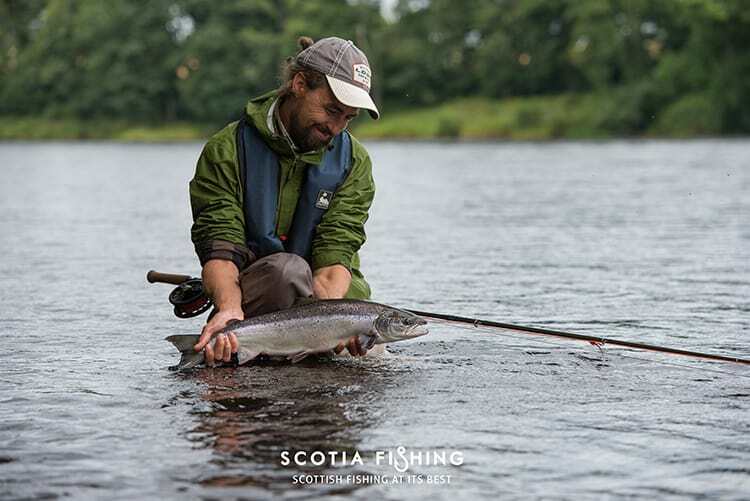 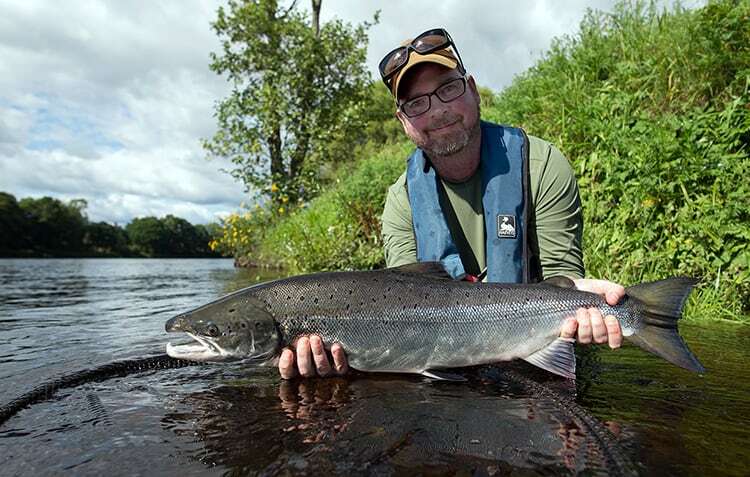 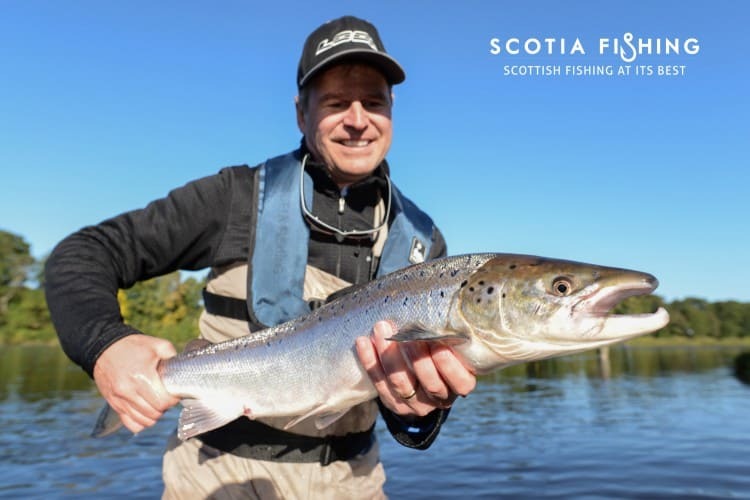 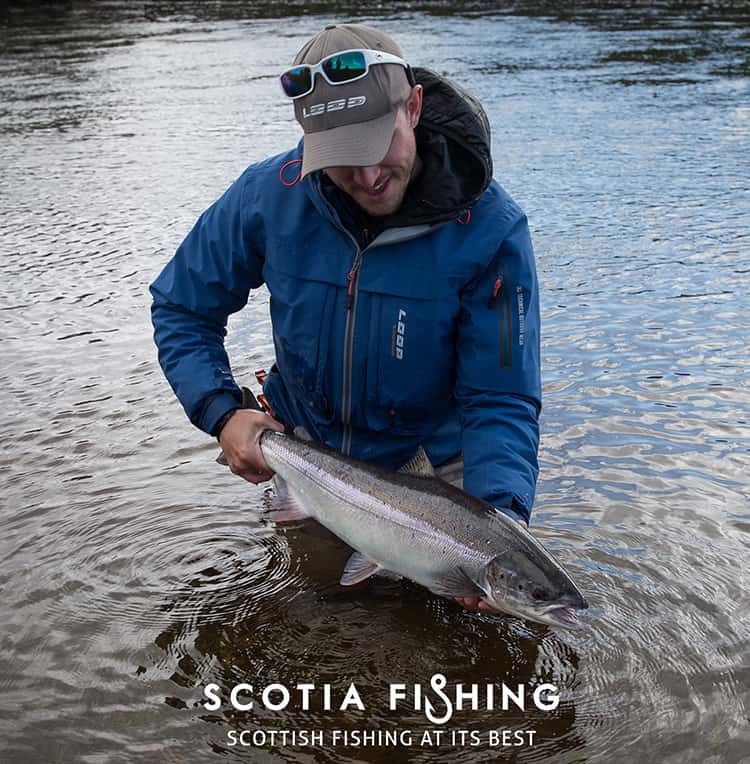 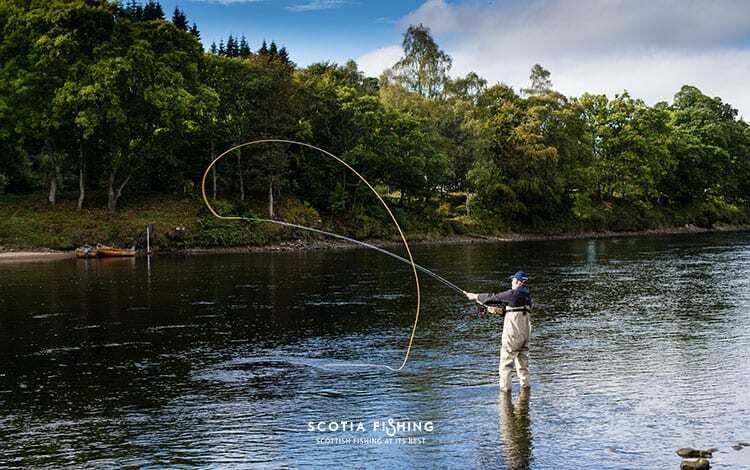 You will learn the history and art of Salmon fishing and Spey casting in Scotland from a qualified Scottish Game Angling Instructor endorsed by Loop Tackle Design. 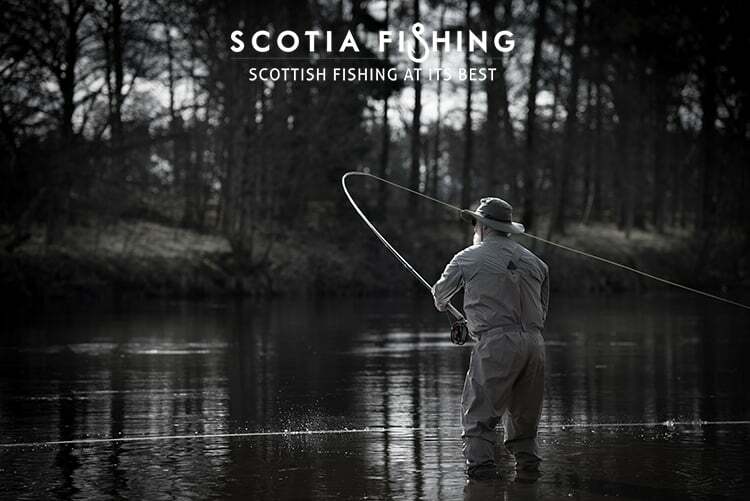 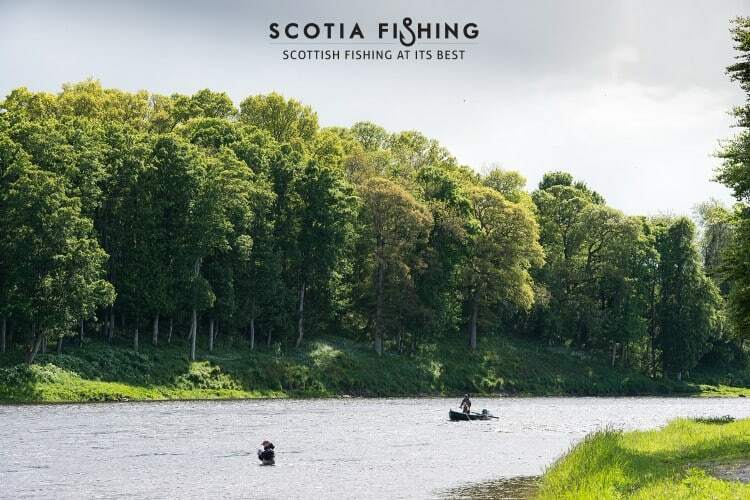 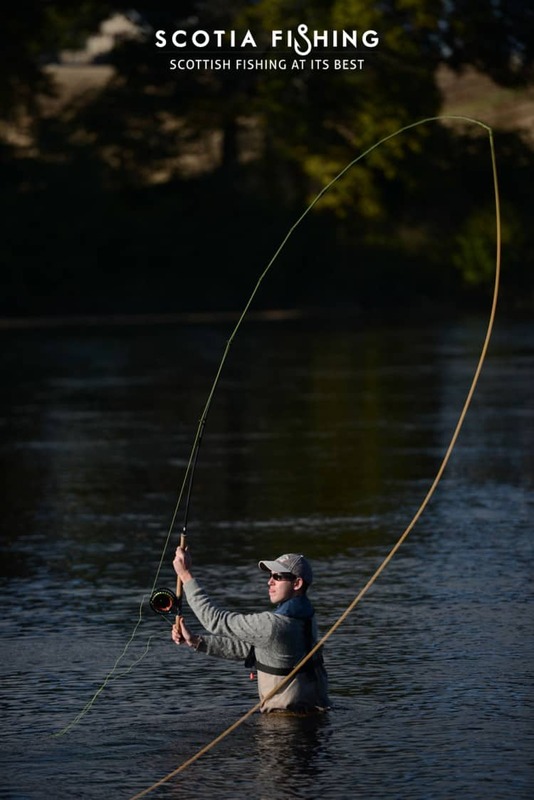 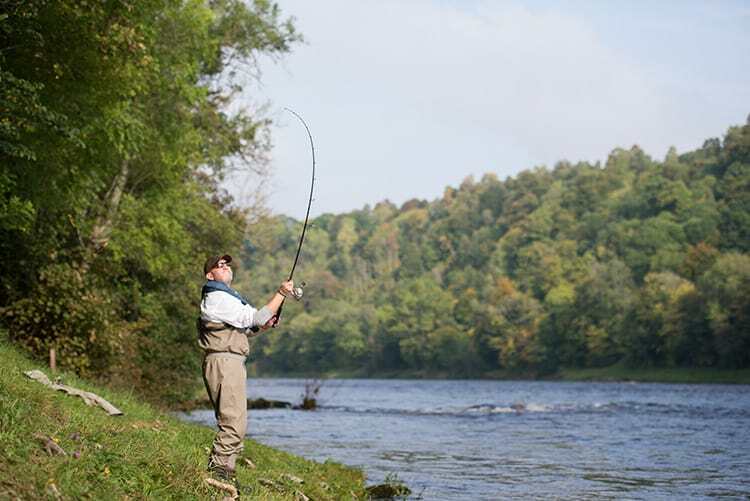 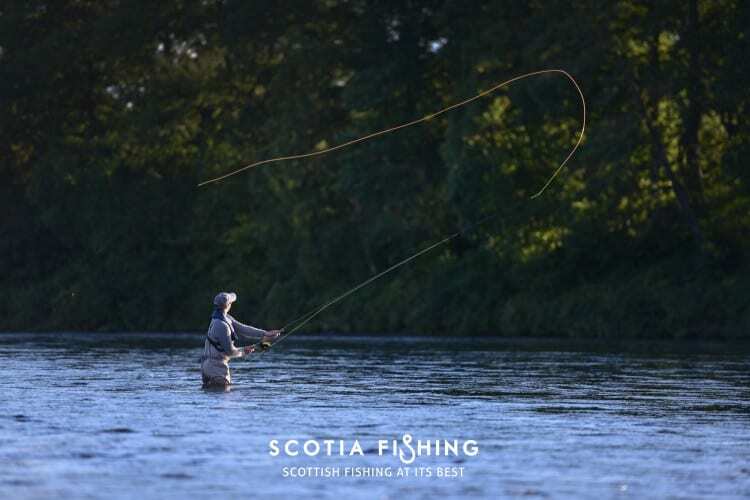 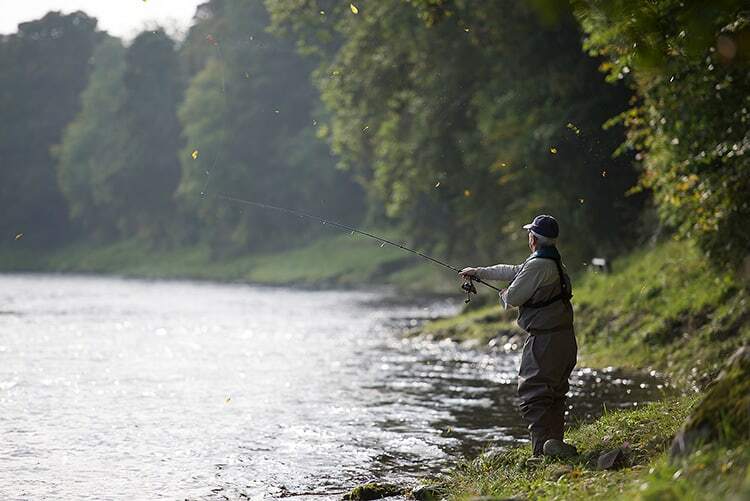 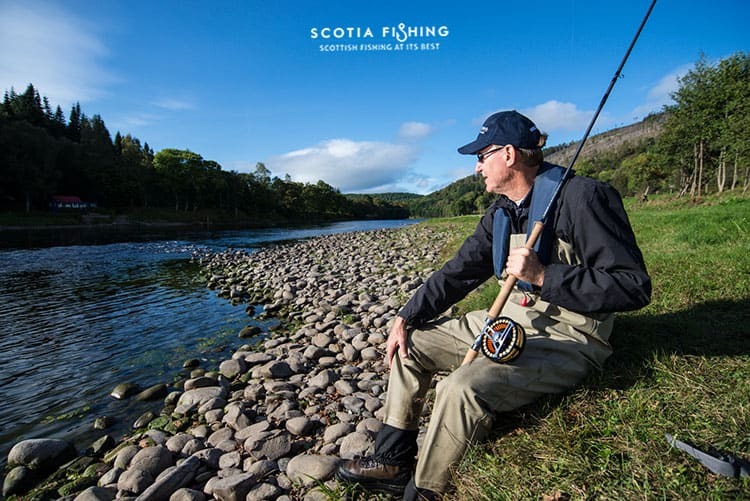 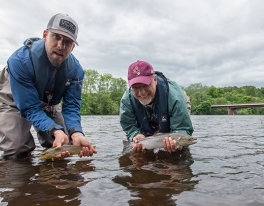 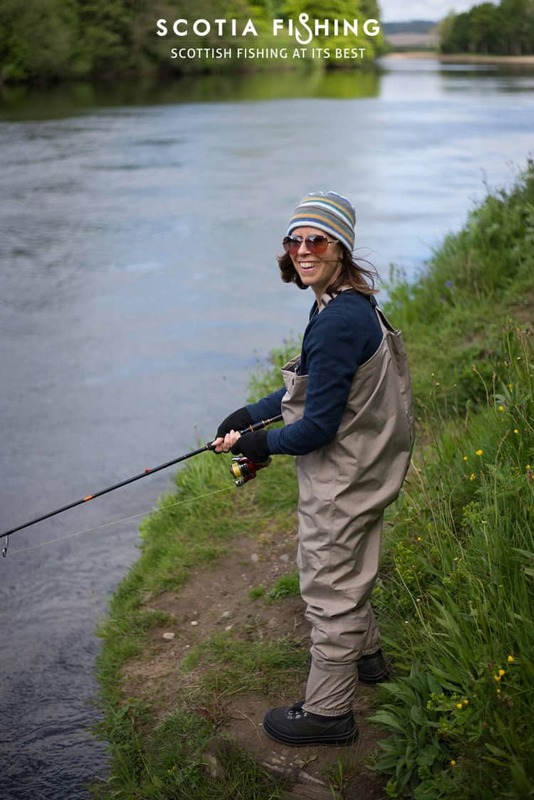 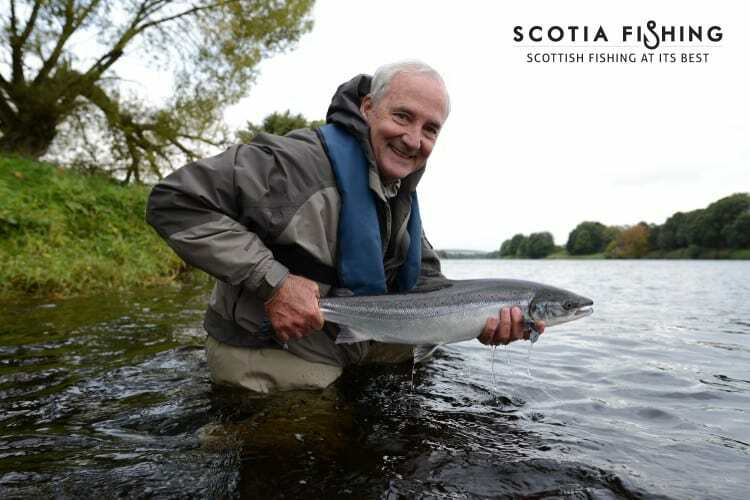 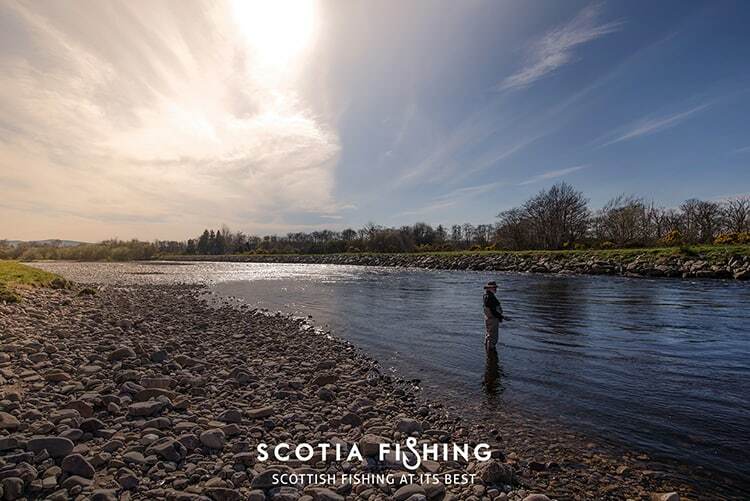 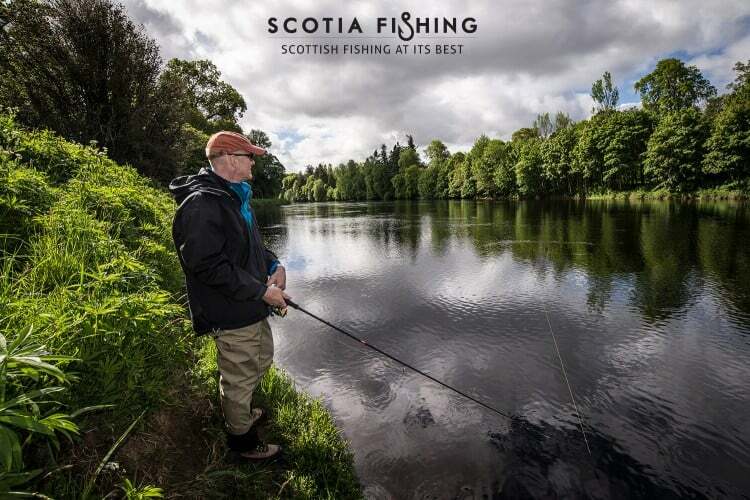 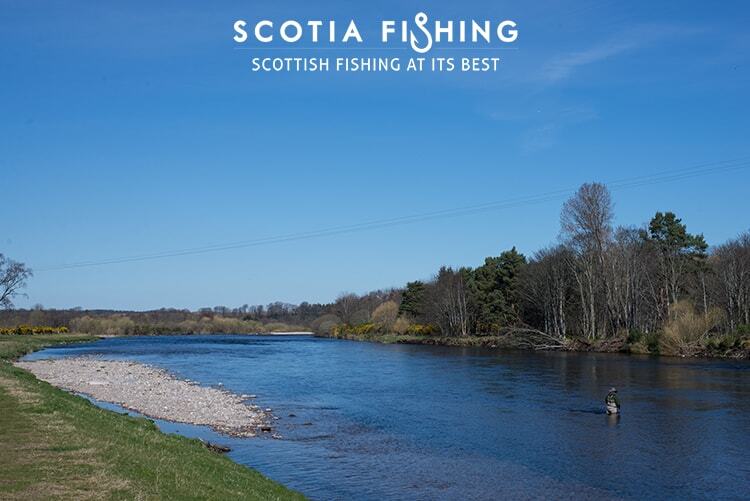 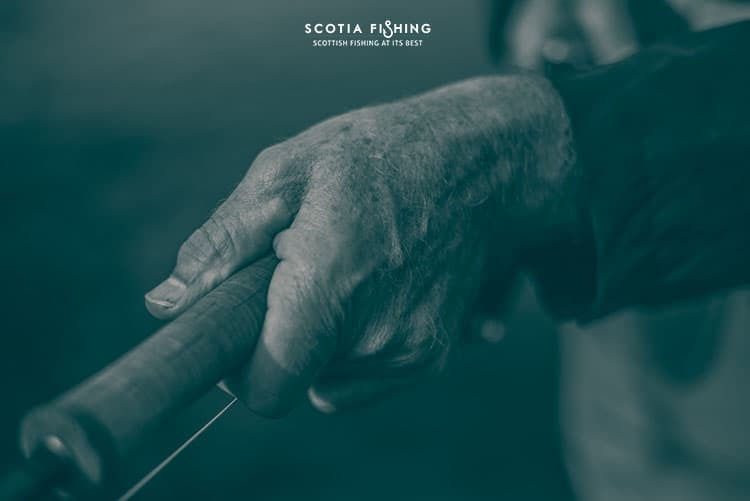 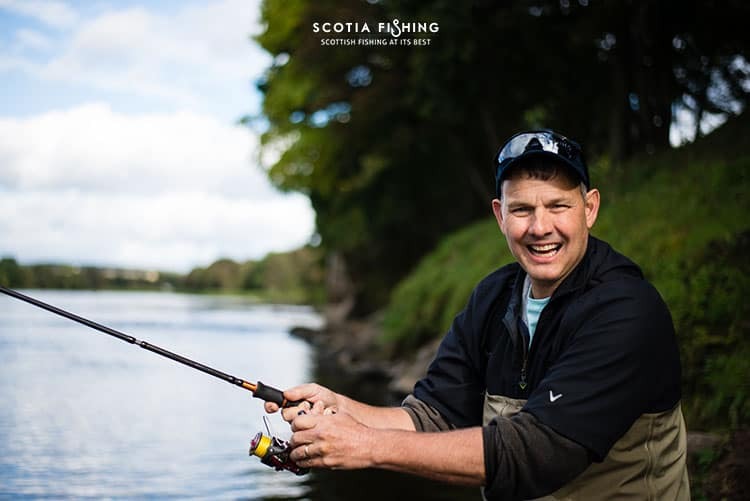 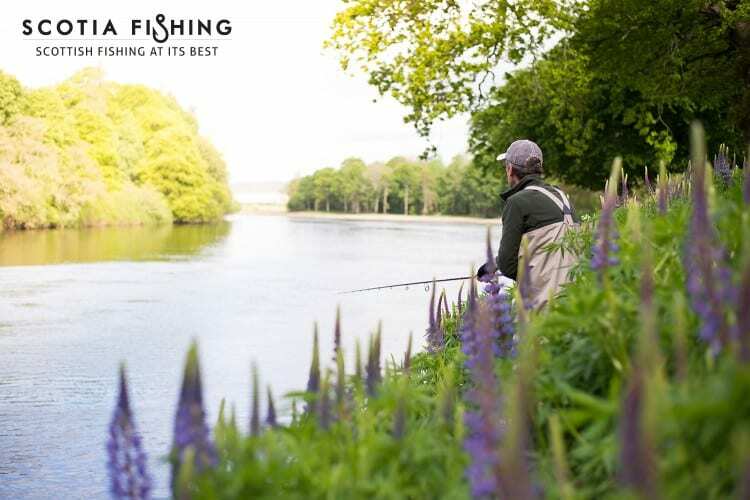 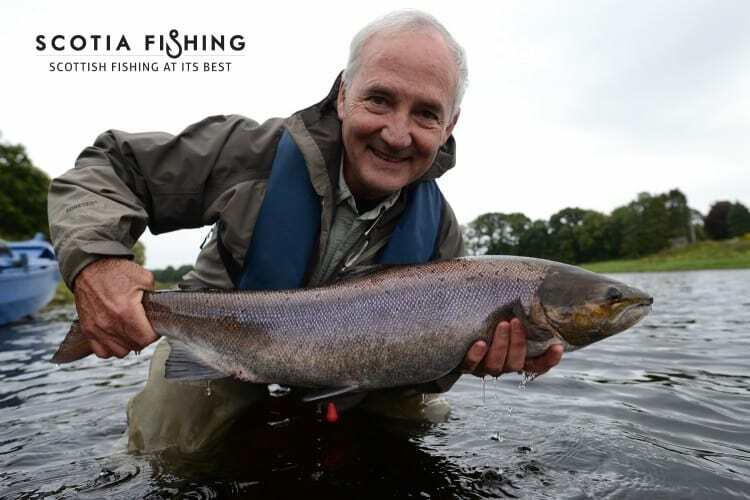 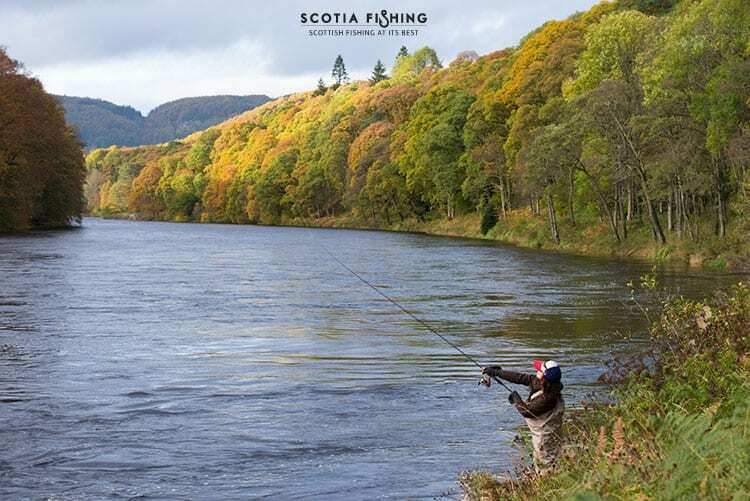 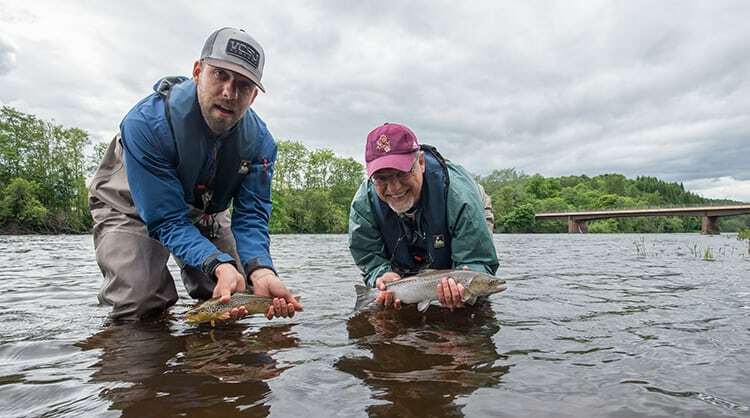 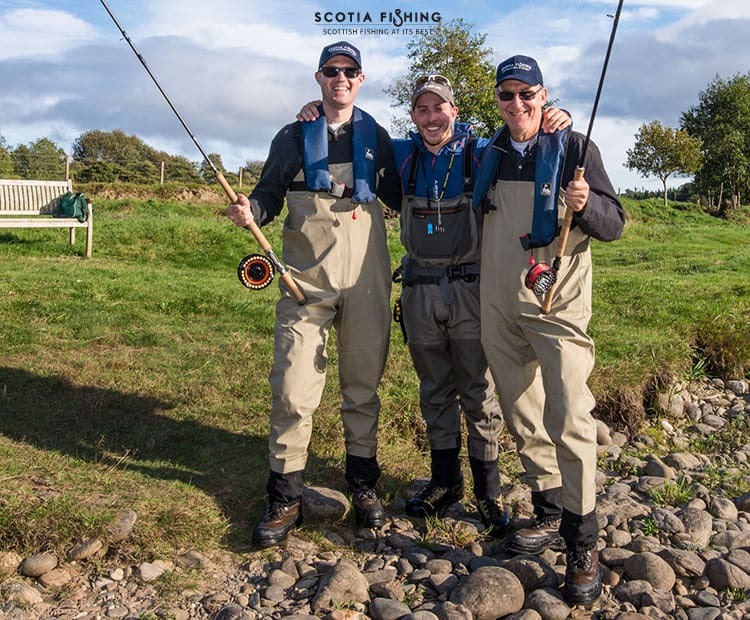 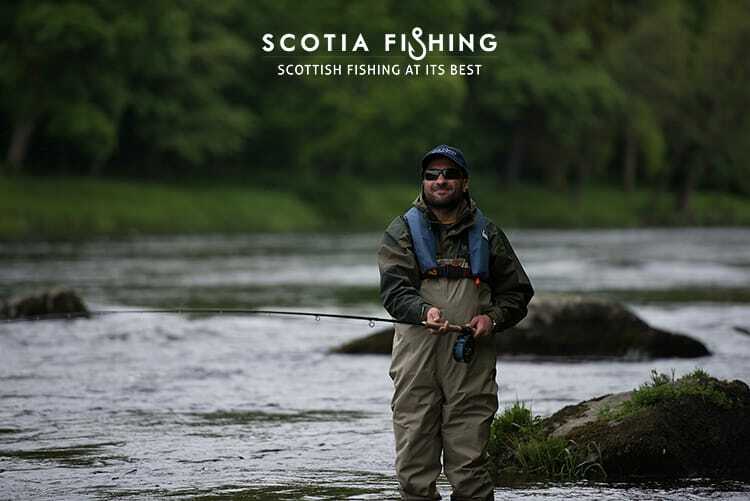 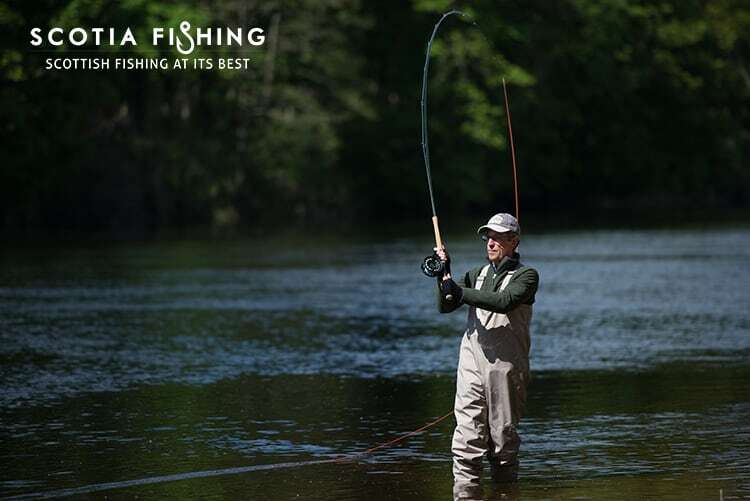 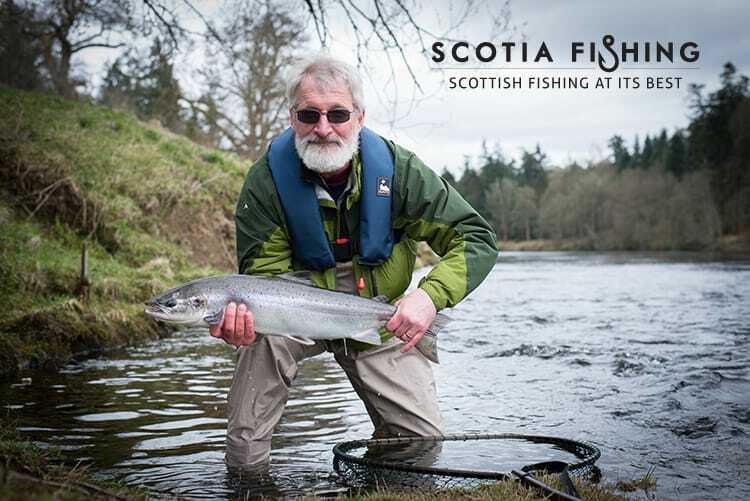 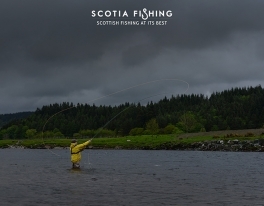 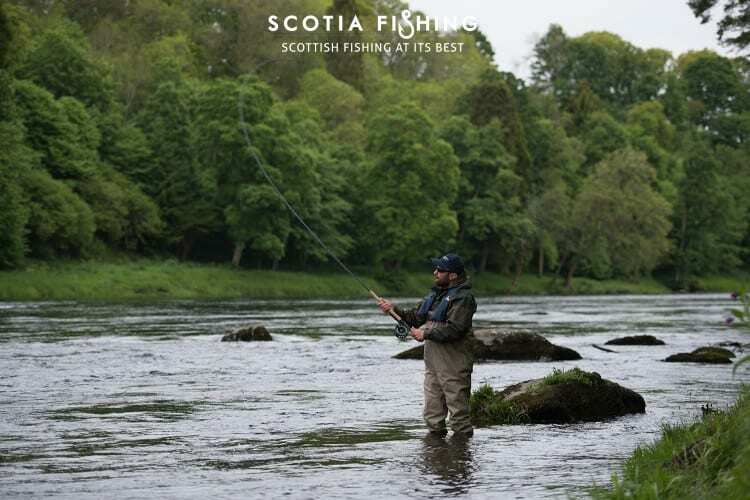 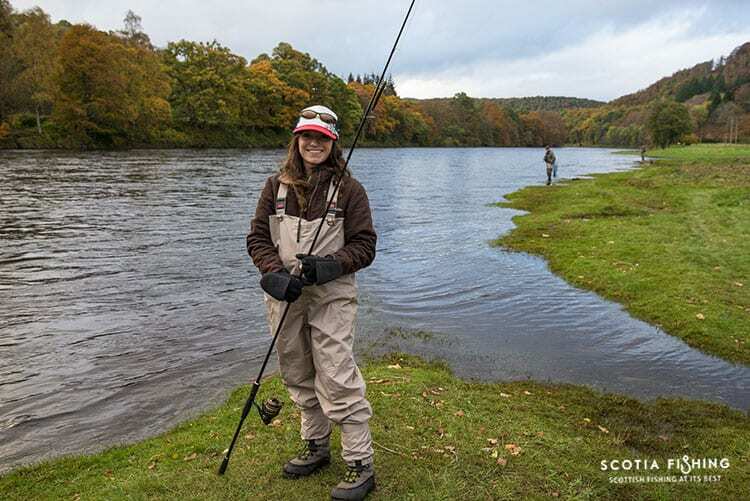 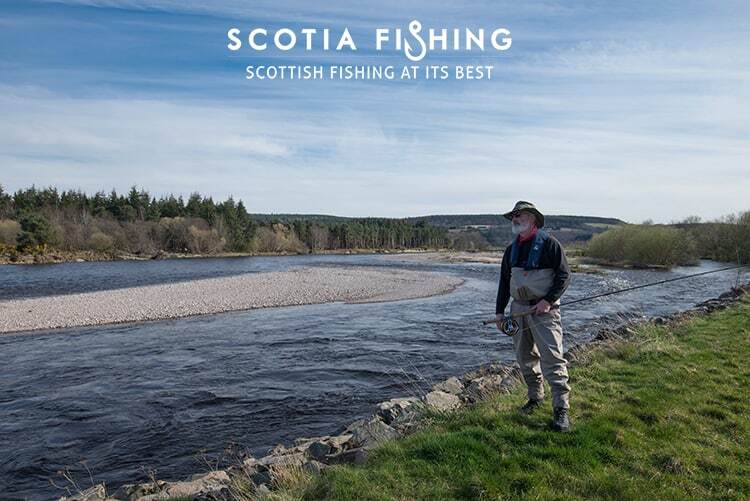 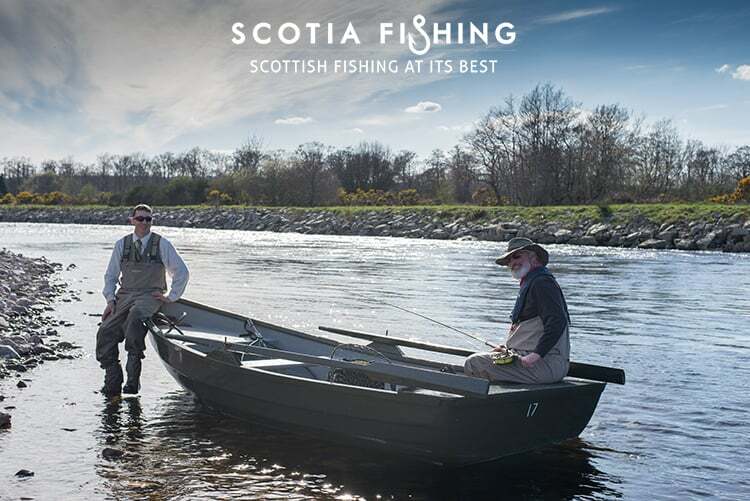 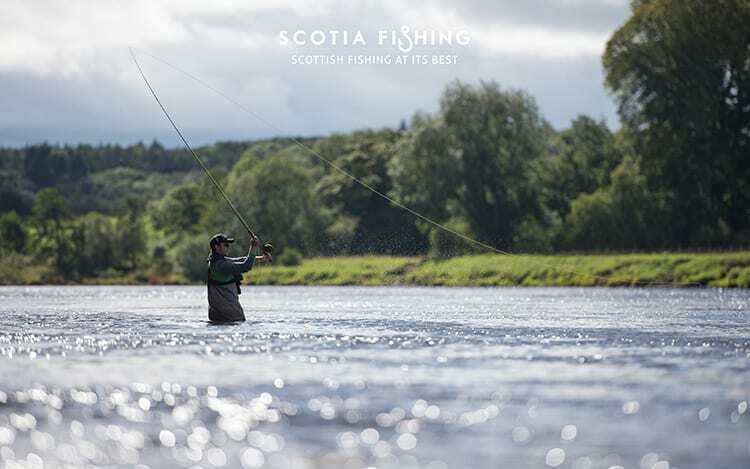 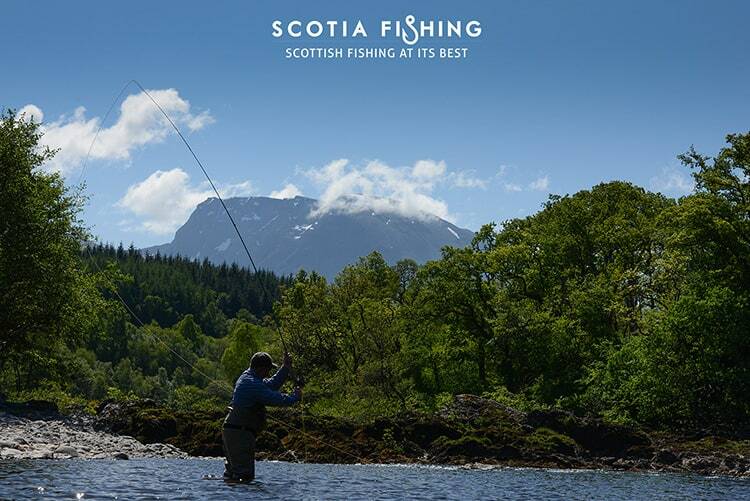 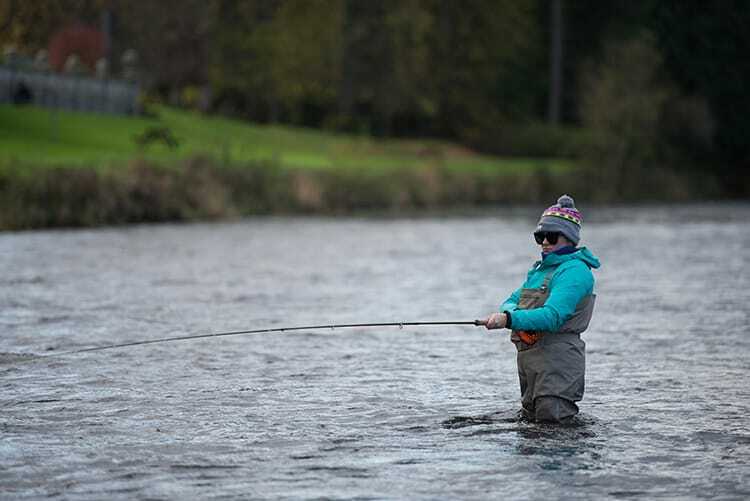 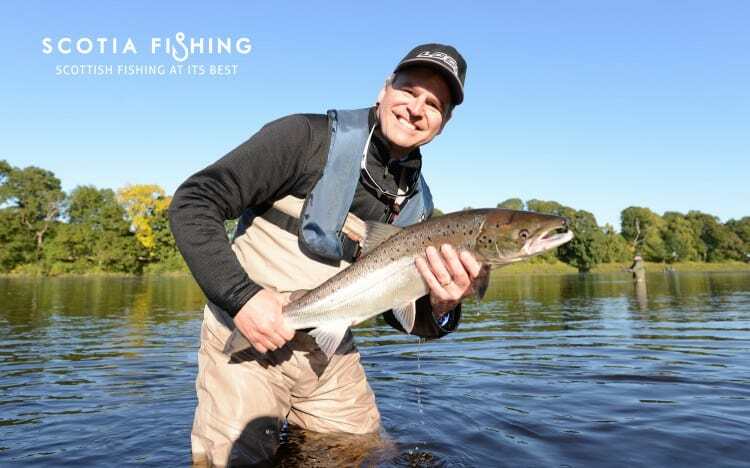 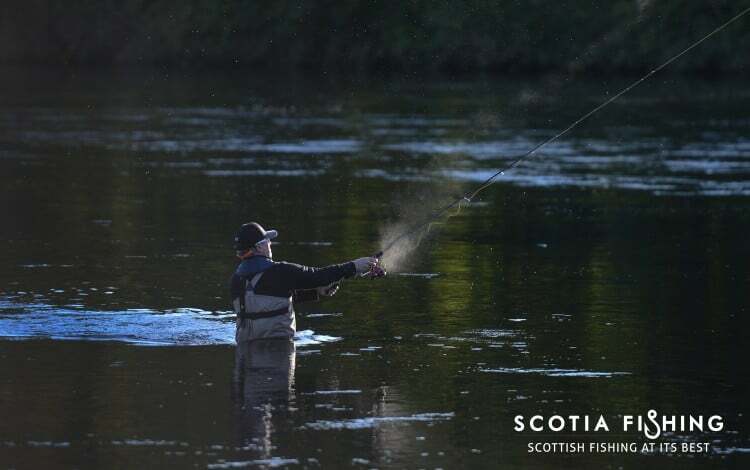 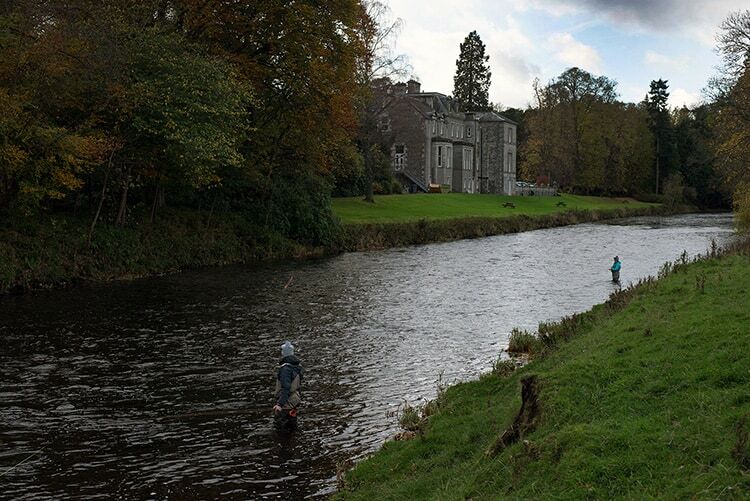 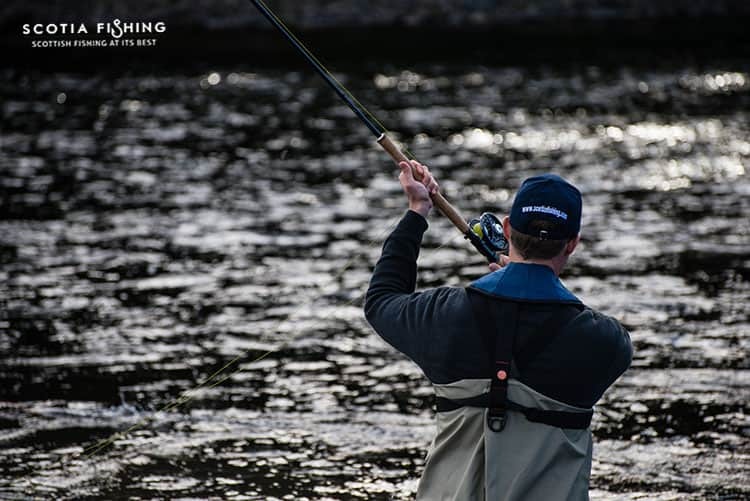 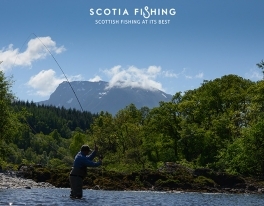 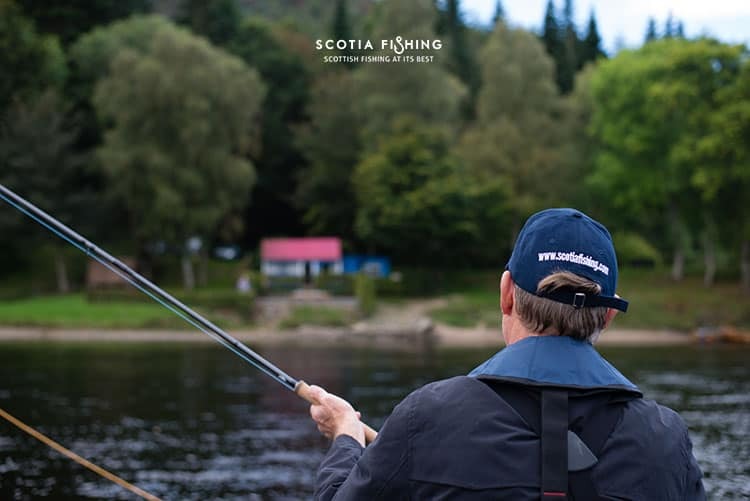 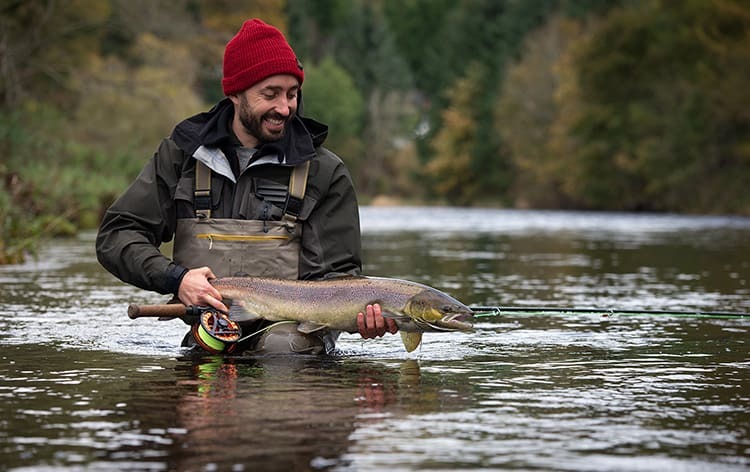 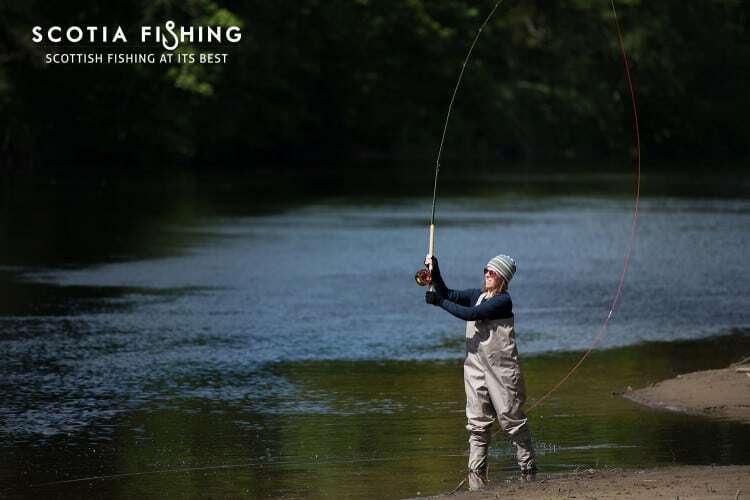 Don’t worry if you haven’t tried Spey casting before, our experienced fishing guides will teach you the basics in no time using professional instruction techniques. 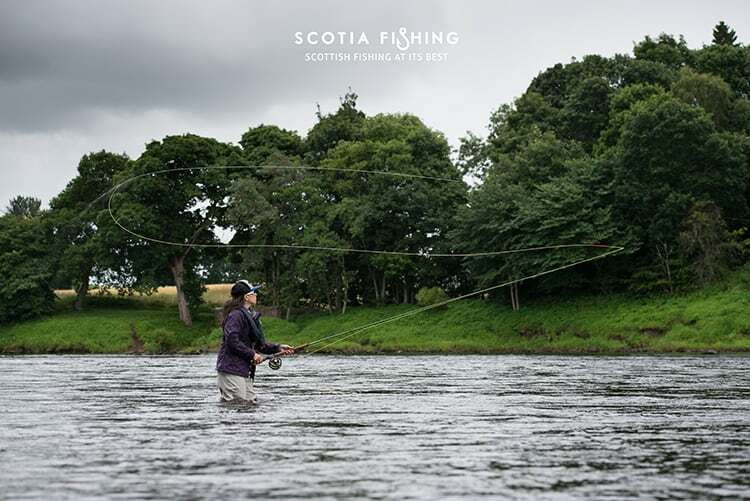 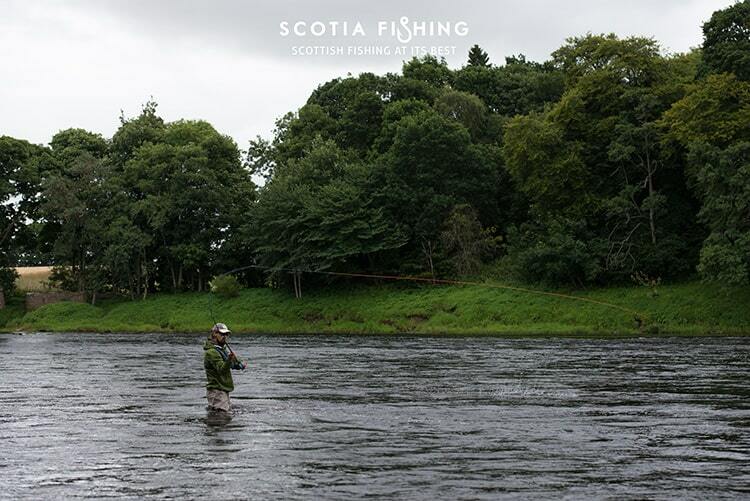 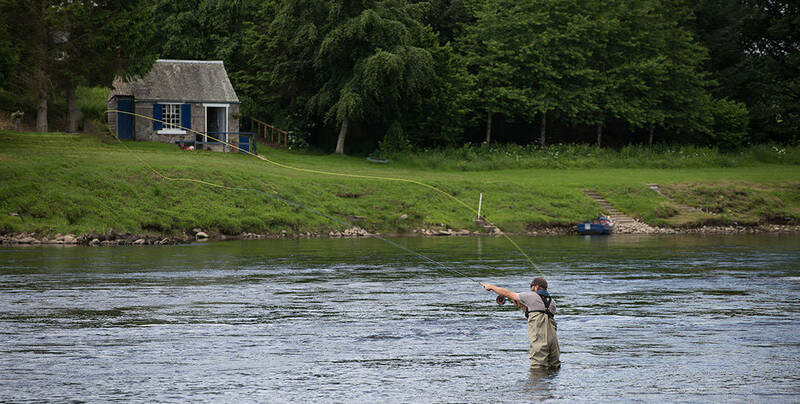 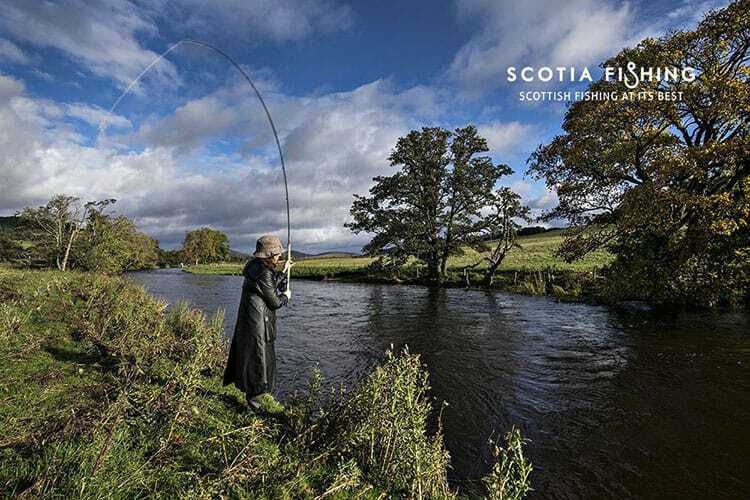 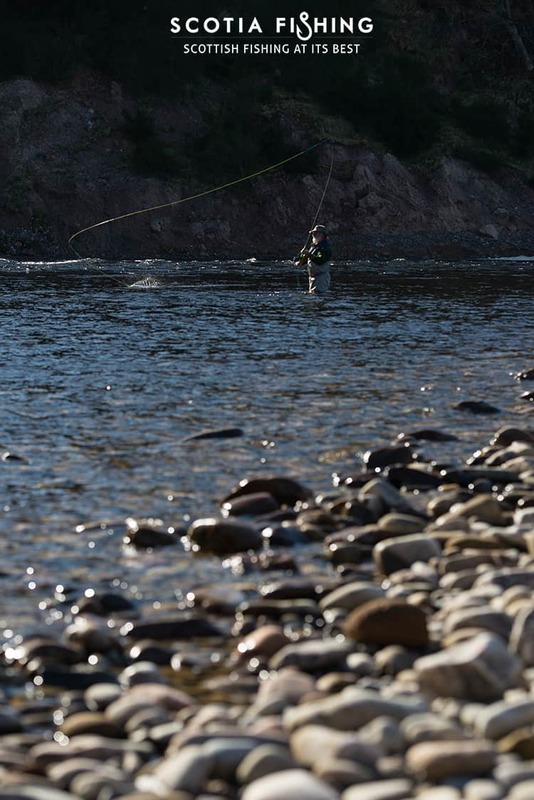 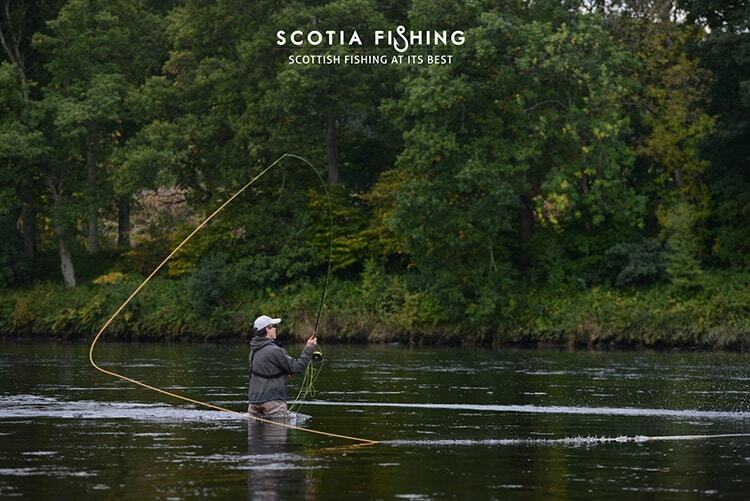 You can fish for Salmon using both traditional and modern Spey rods and lines. 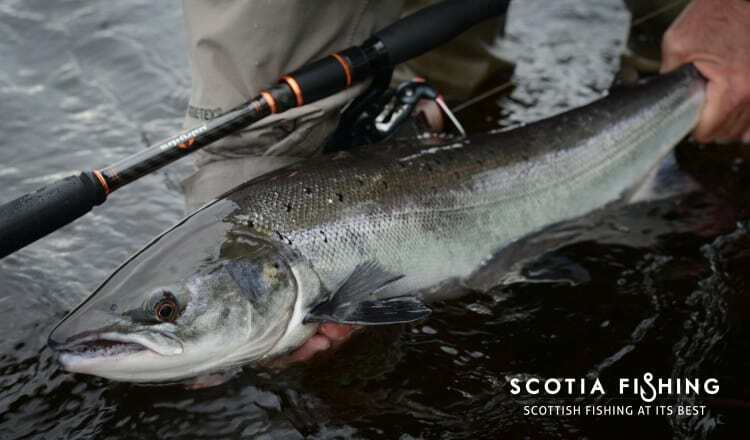 We will provide quality Salmon fly fishing tackle including fly rod and reels from Loop Tackle Design and flies made in Scotland. 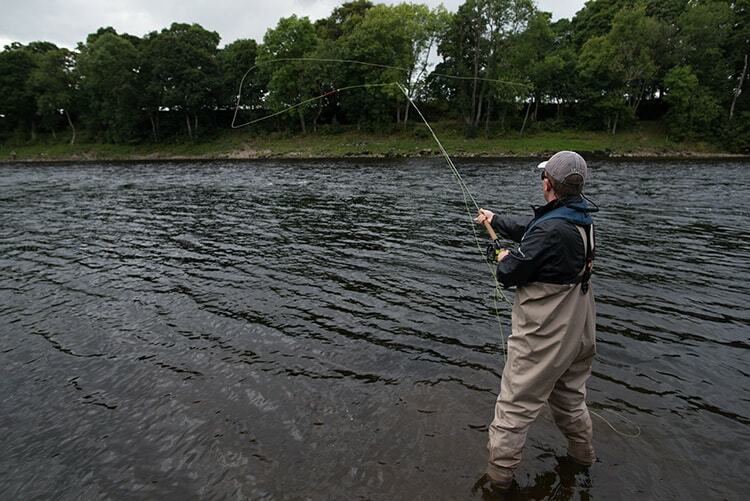 There’s also the possibility to spin for Salmon if you wish and when conditions/rules allow. 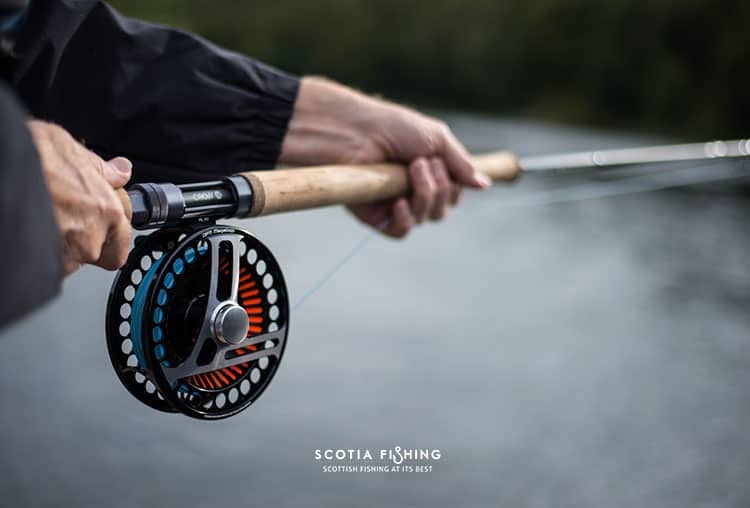 We provide premium spinning gear from Sakura Fishing. 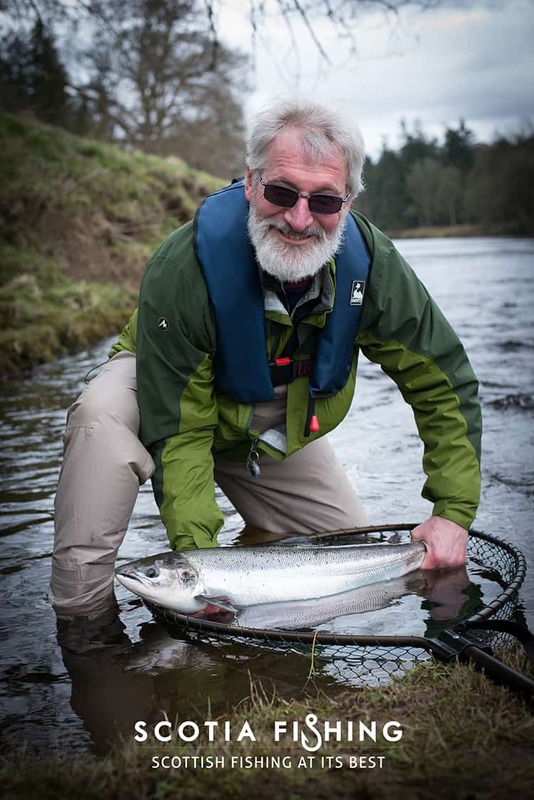 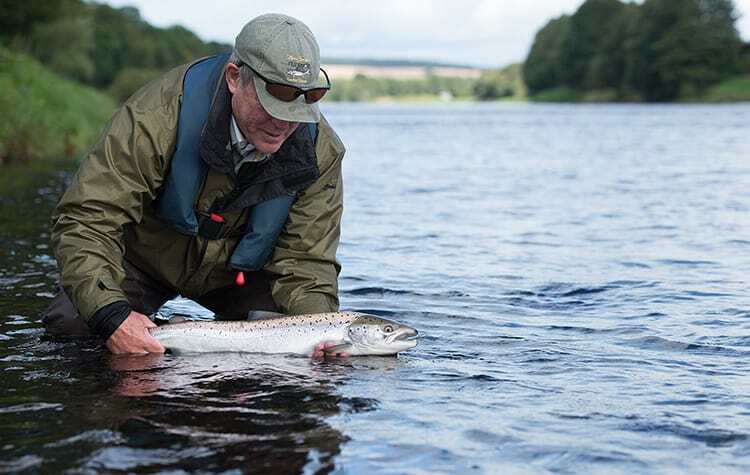 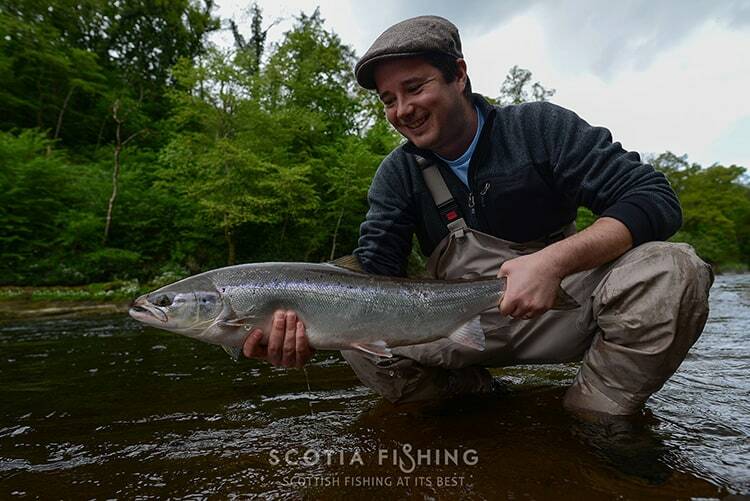 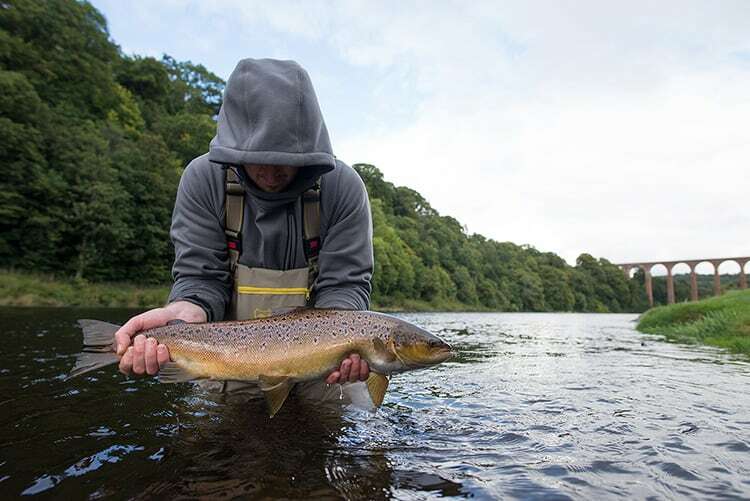 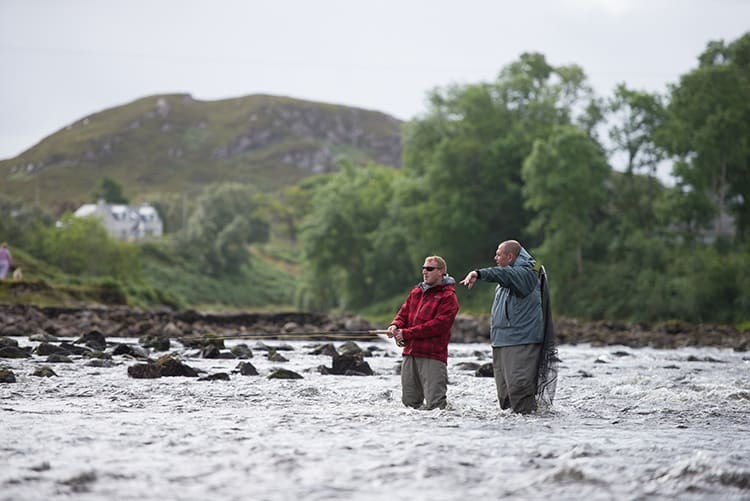 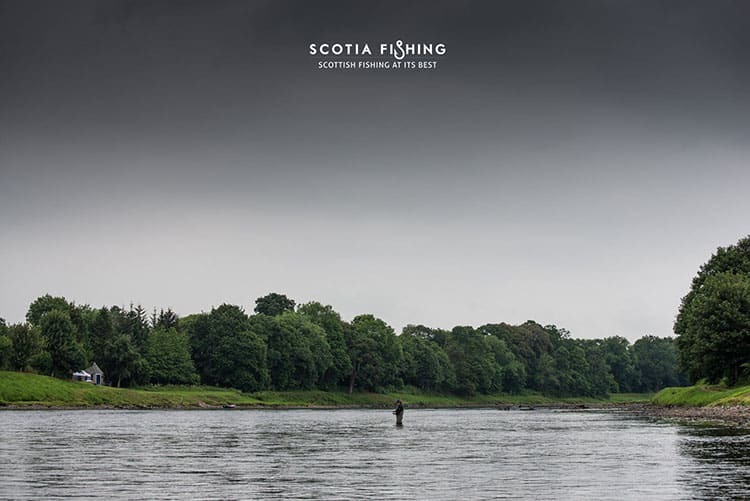 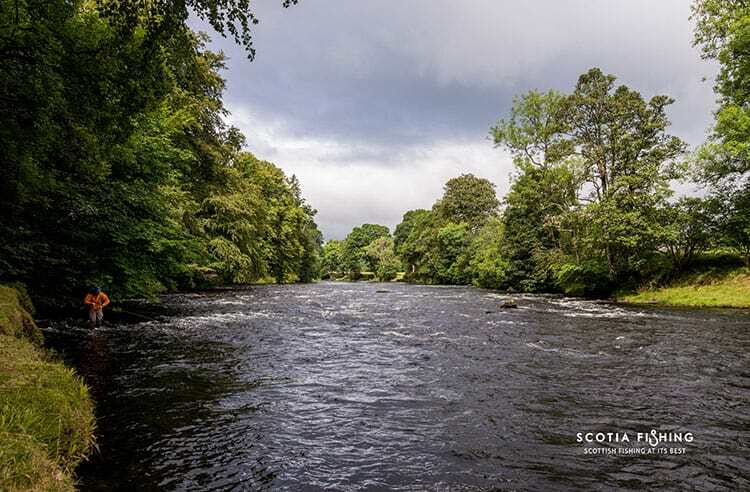 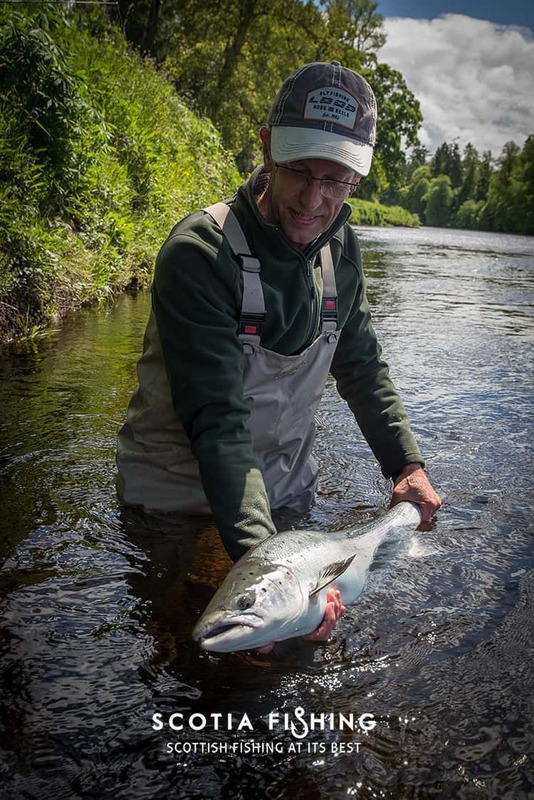 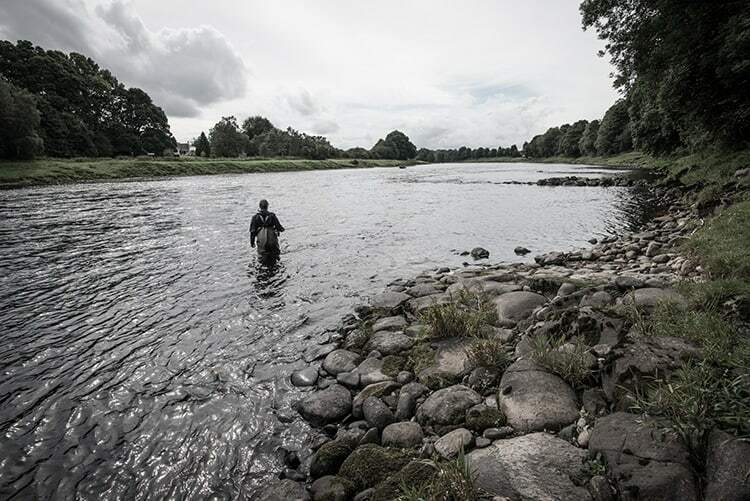 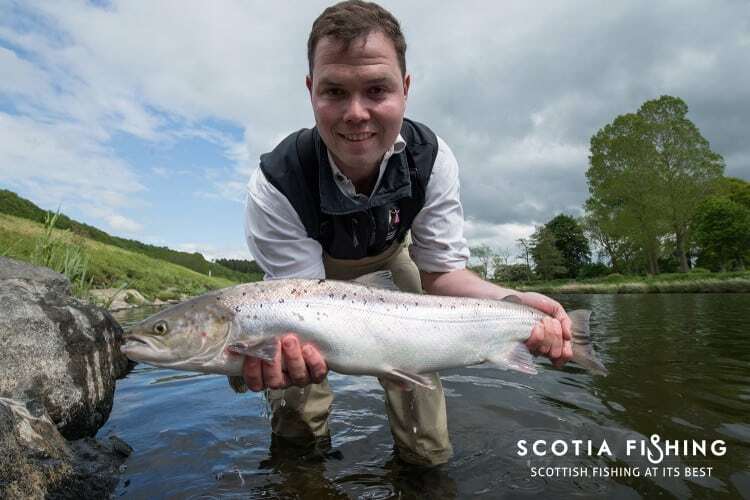 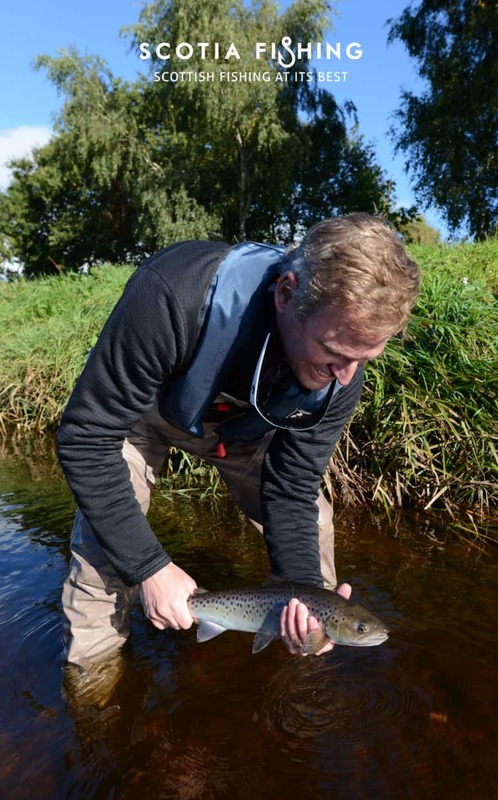 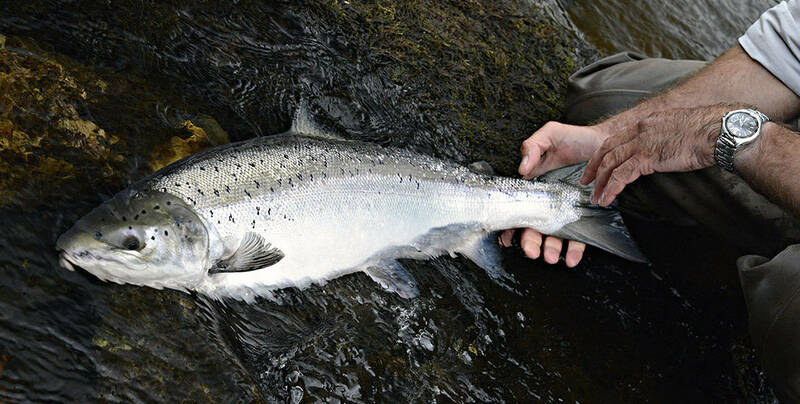 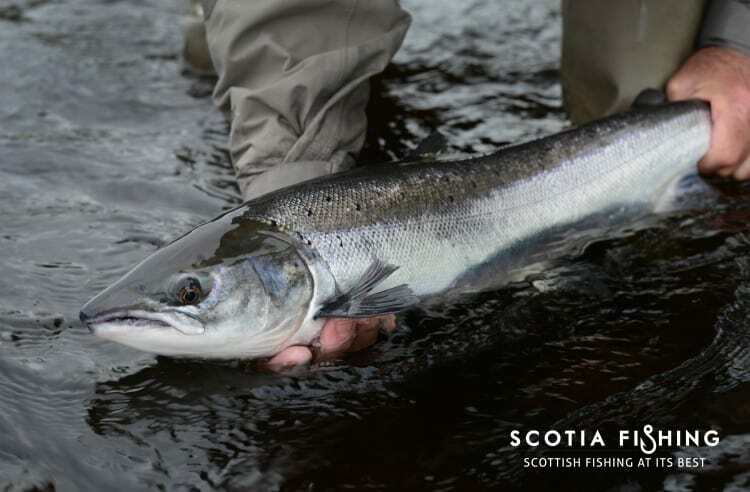 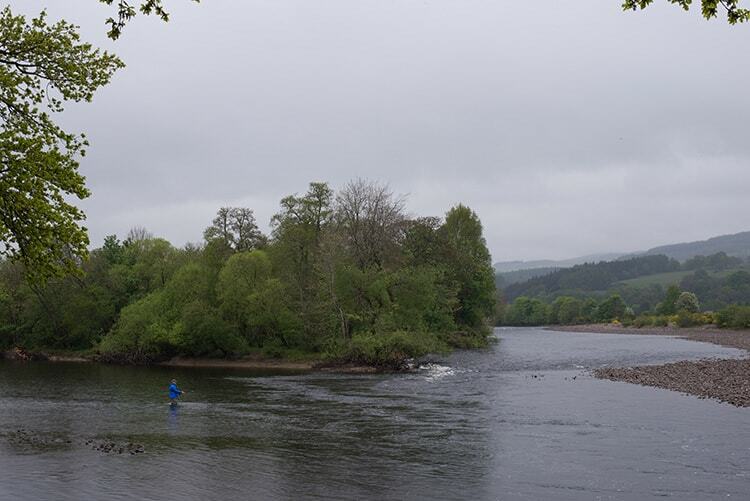 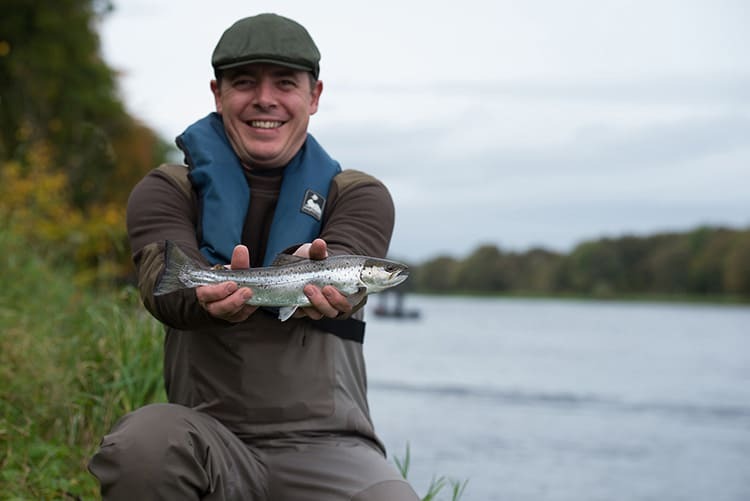 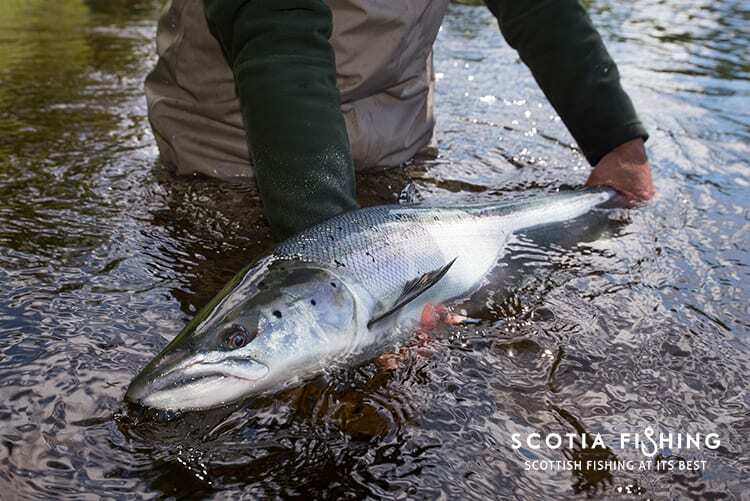 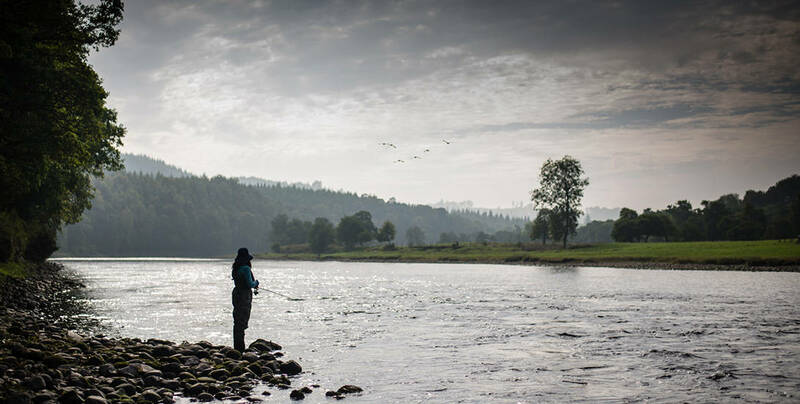 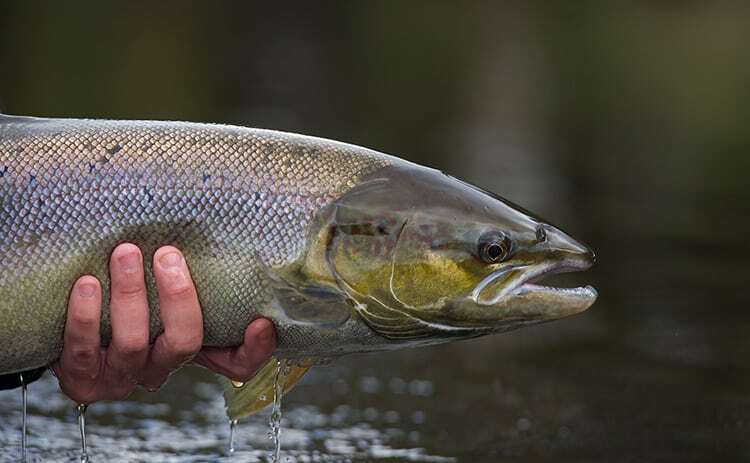 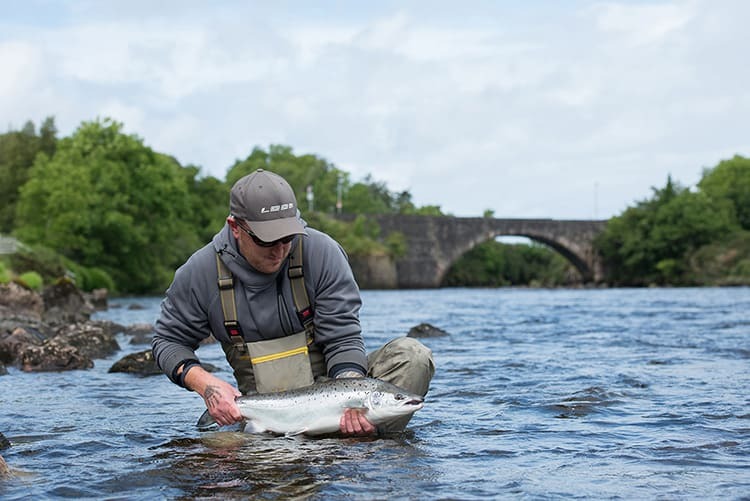 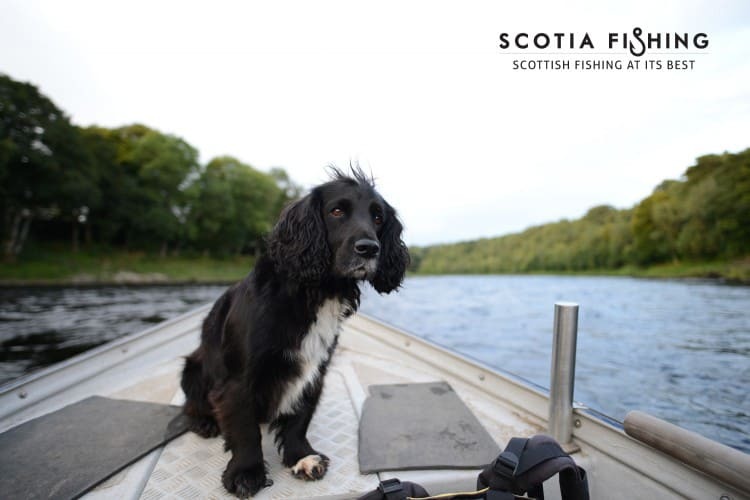 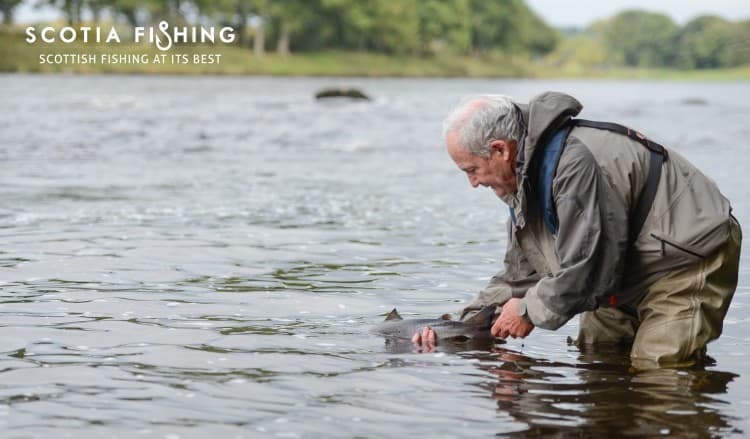 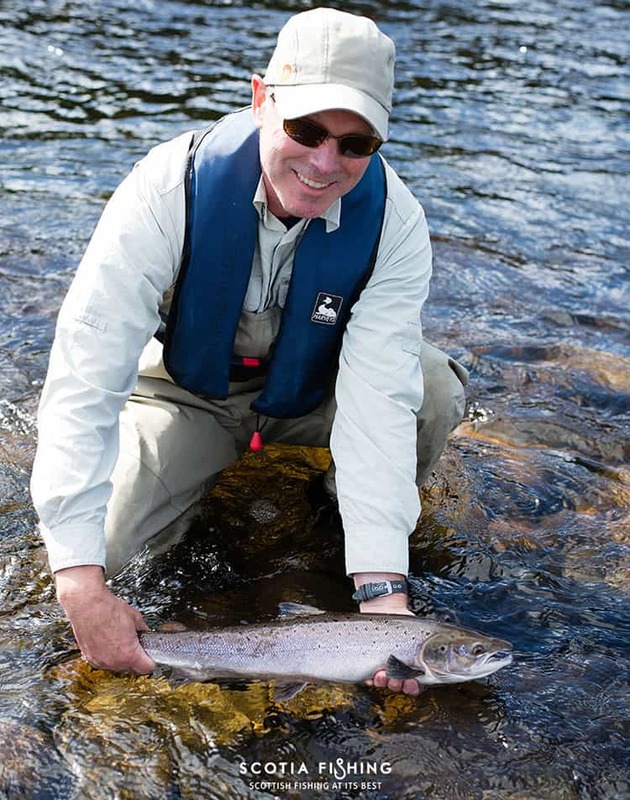 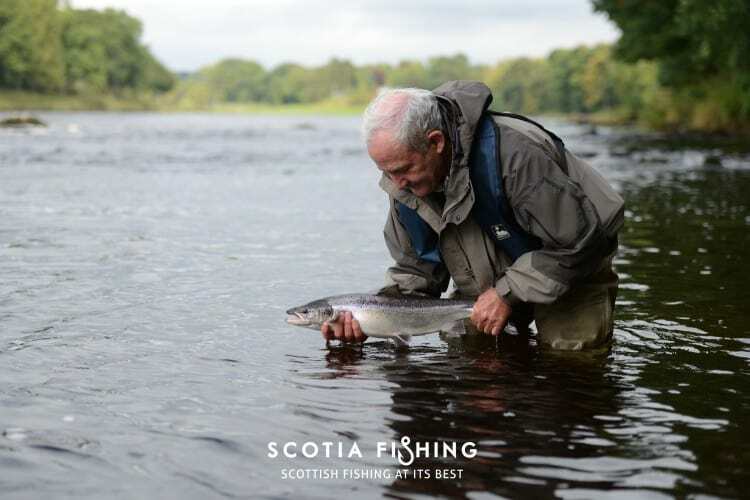 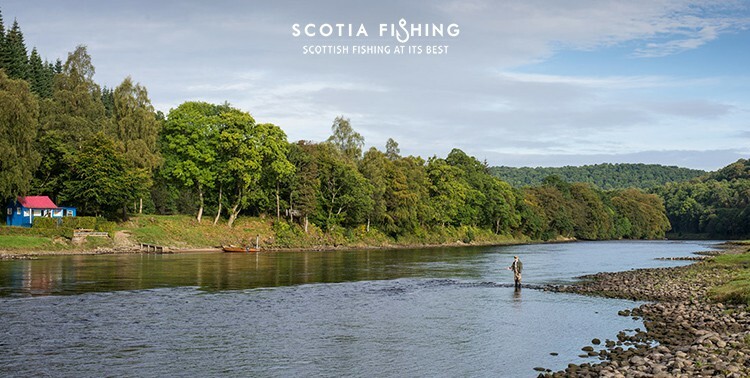 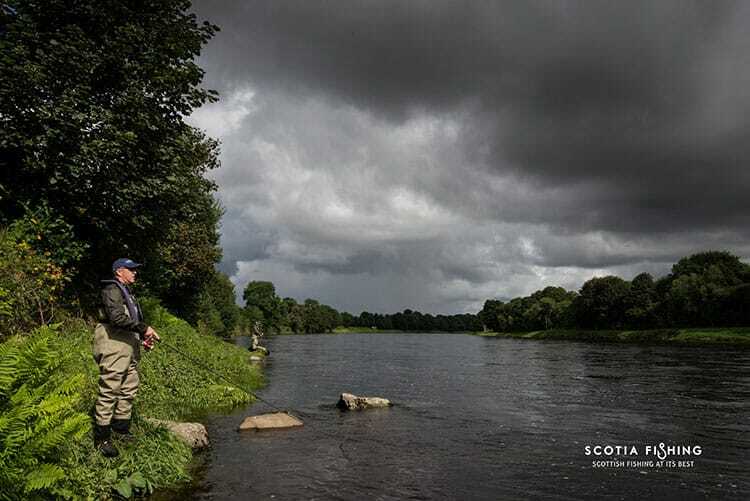 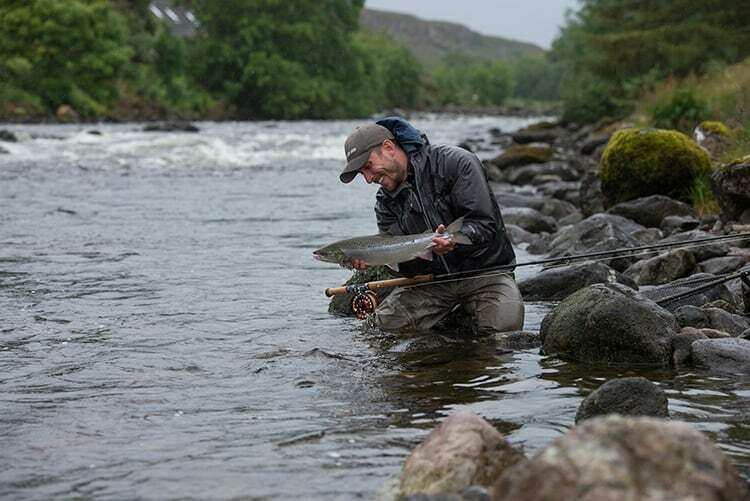 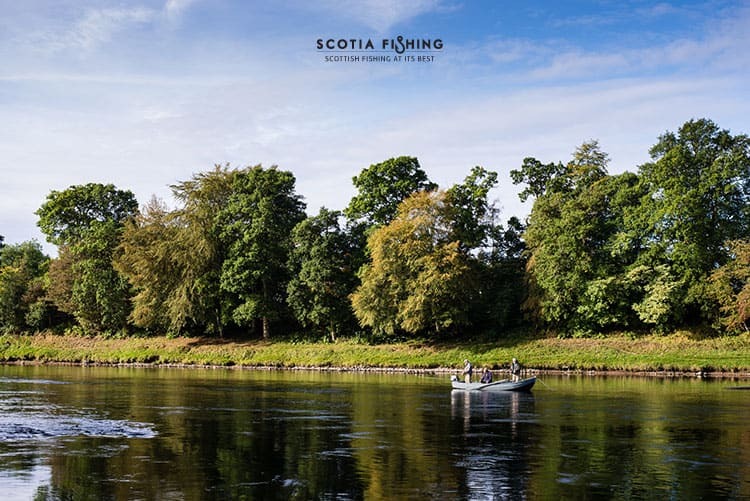 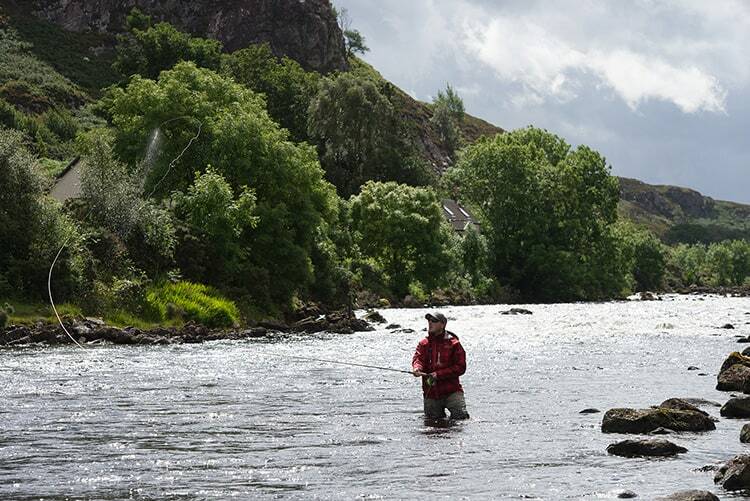 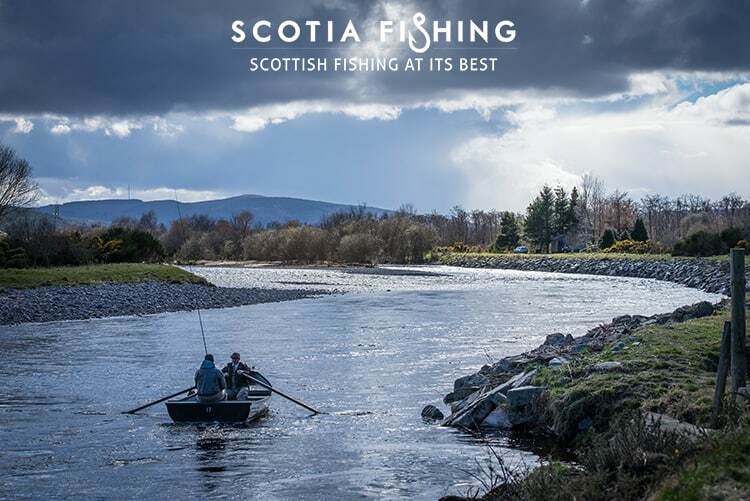 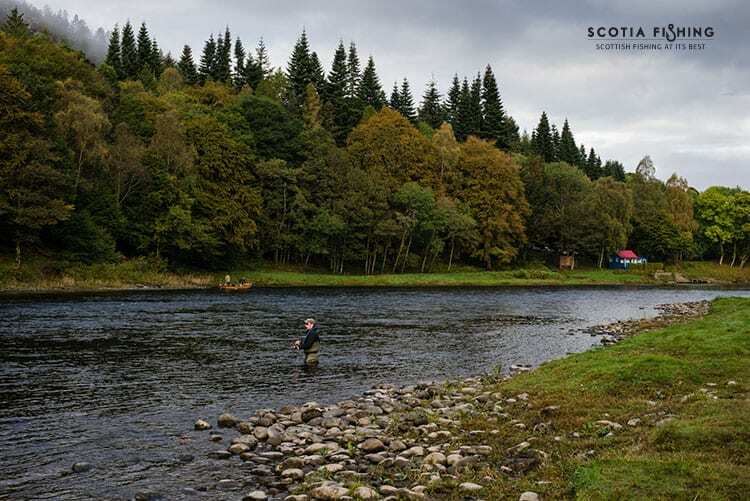 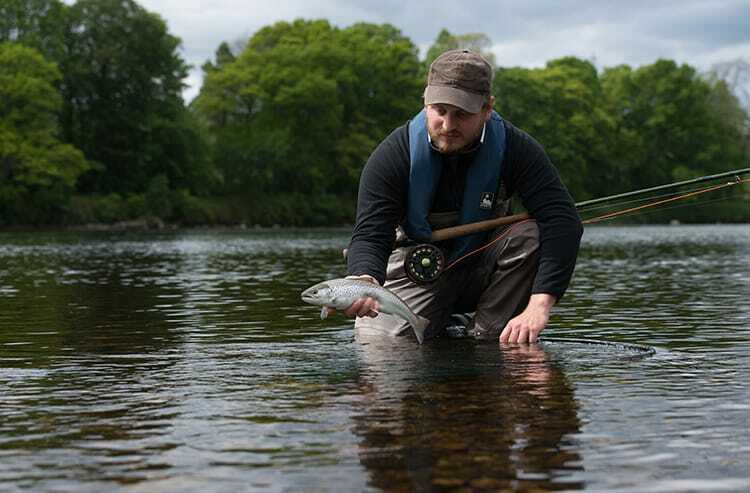 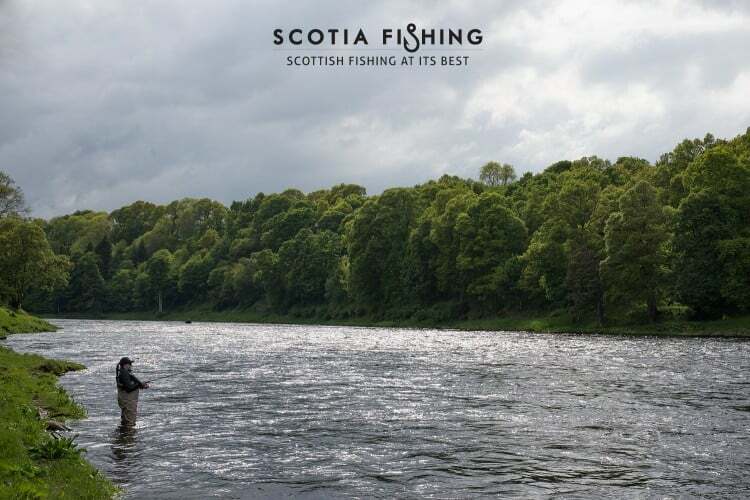 Our Scottish Salmon fishing guides will use their experience and water craft to select the river that offers you the best chance of catching that “bar of silver”. 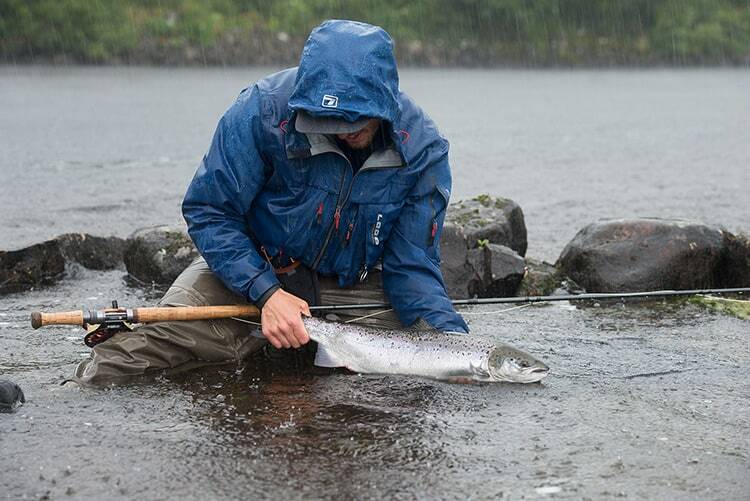 When conditions aren’t favourable we can recommend an exciting alternative fishing trip. 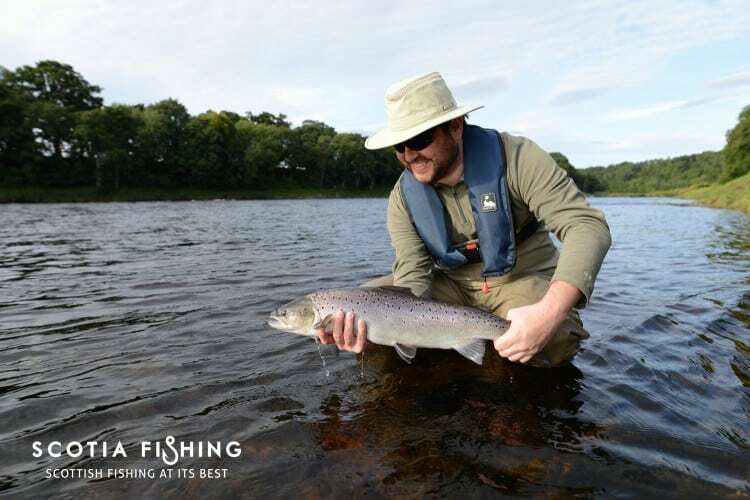 We pride ourselves on offering Salmon fishing trips in Scotland to suit all experience levels and will tailor the package to suit your requirements. 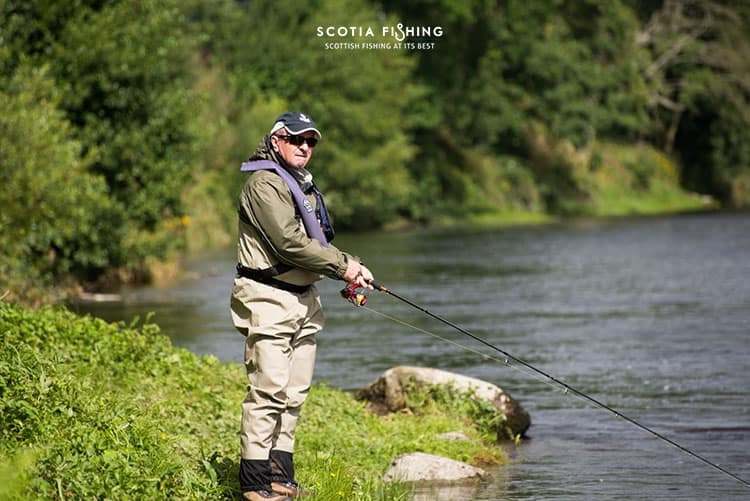 Your friendly Salmon fishing guide will collect you from your hotel and take you on a scenic drive to the river of choice. 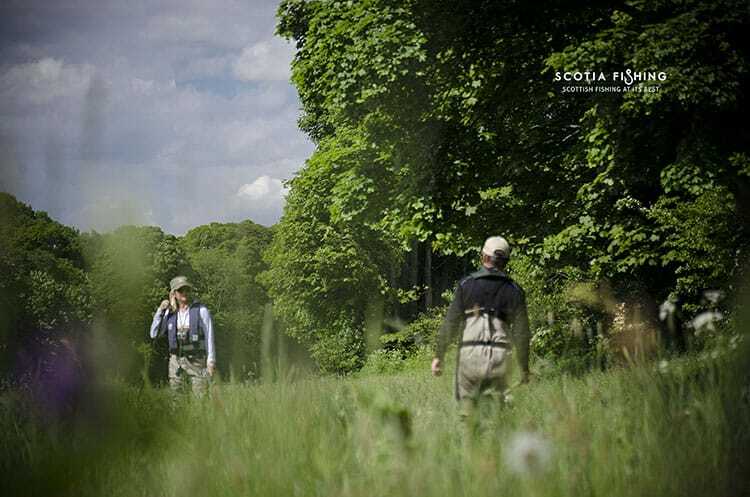 Upon arrival refreshments will be offered. 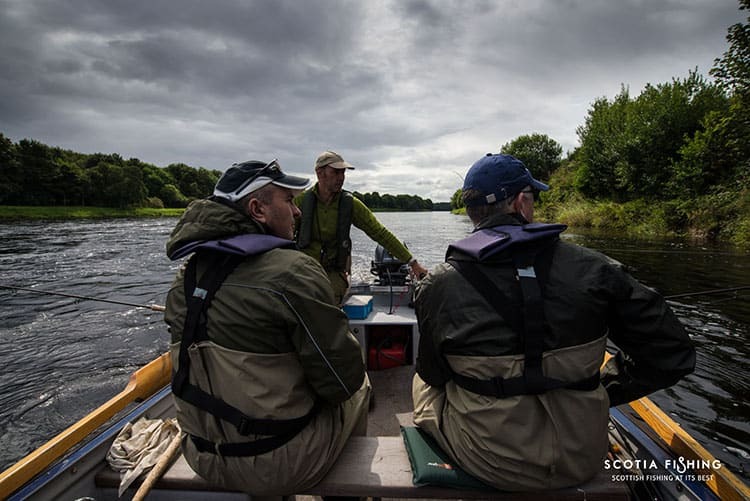 You will then be briefed on safety and the equipment you will be using today. 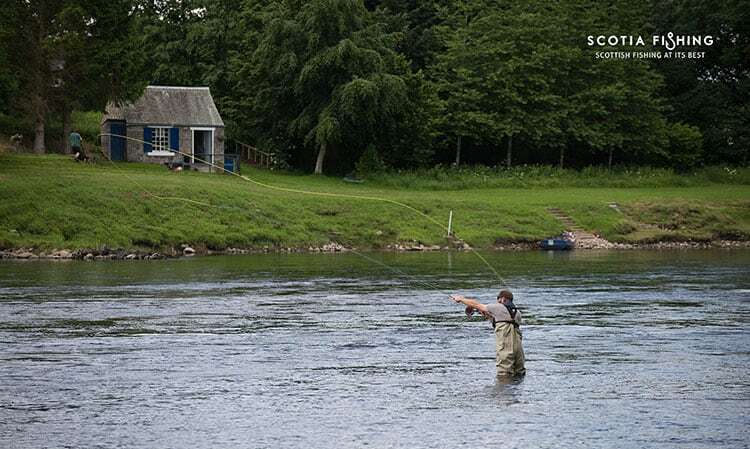 Qualified spey casting tuition will be given from SGAIC instructor if required. 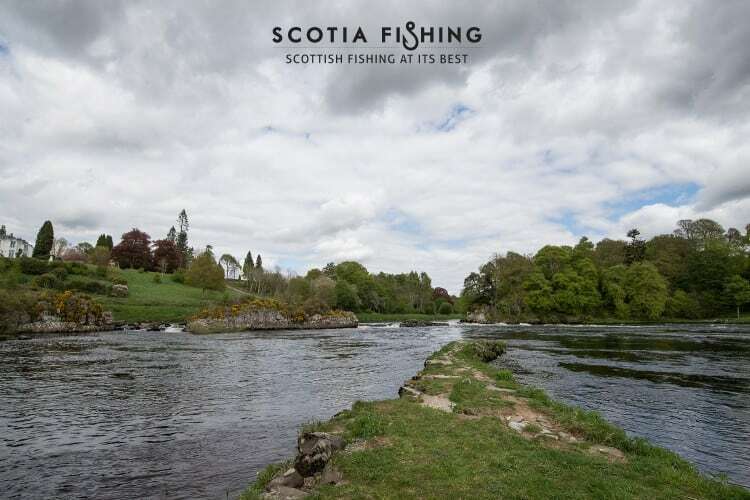 Fishing will then commence and your attentive guide will be by your side to offer expert advice, one to one tuition and take photographs throughout the day. 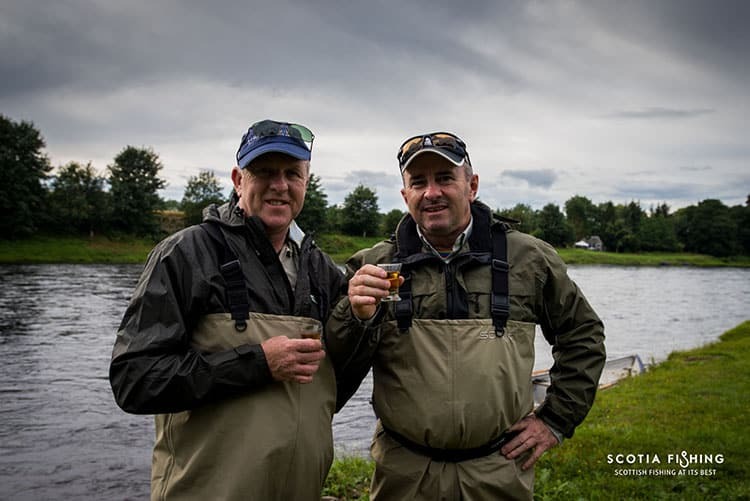 Home-made Scottish themed lunches such as soup/chowders, gourmet burgers or sandwiches will be provided. 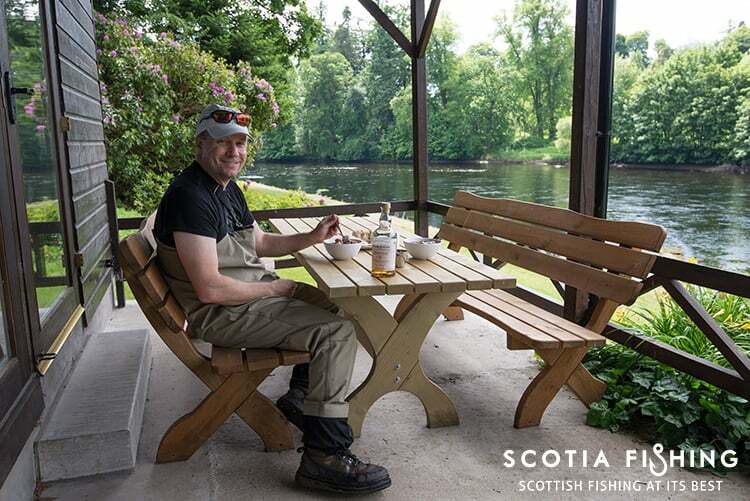 Enjoy your lunch with a local dram, gin or craft beer. 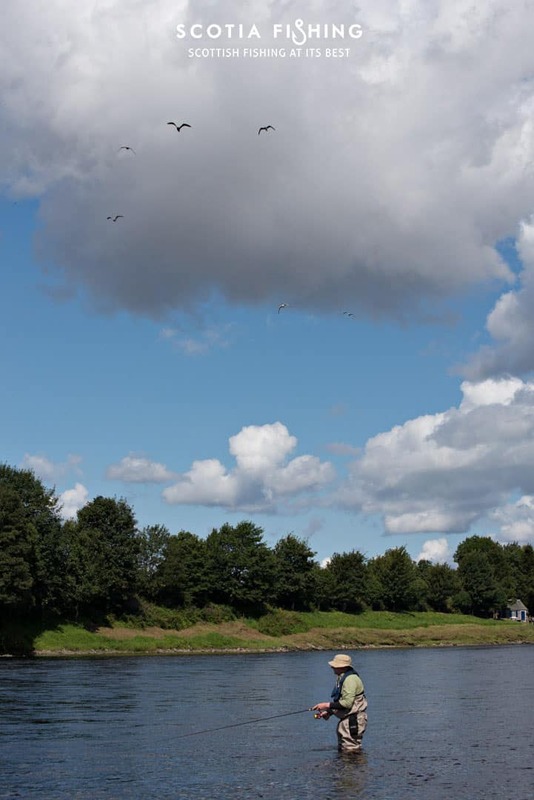 Snacks and non-alcoholic drinks will be available throughout the day. 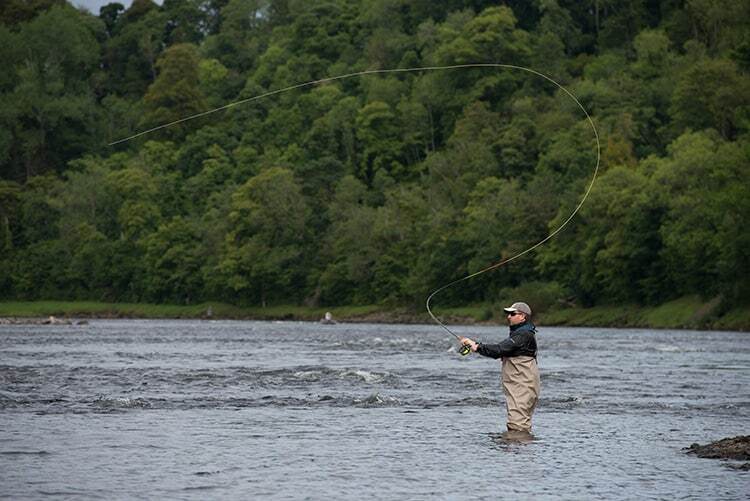 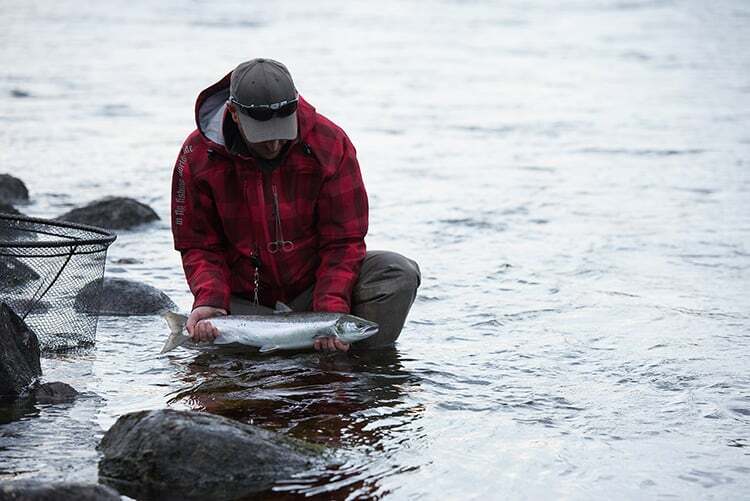 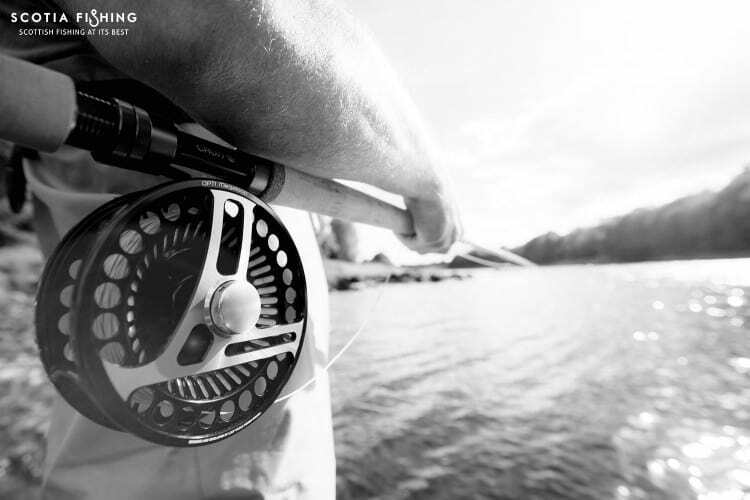 Lunch breaks are mandatory when Salmon fishing usually 1pm – 2pm depending on the beat. 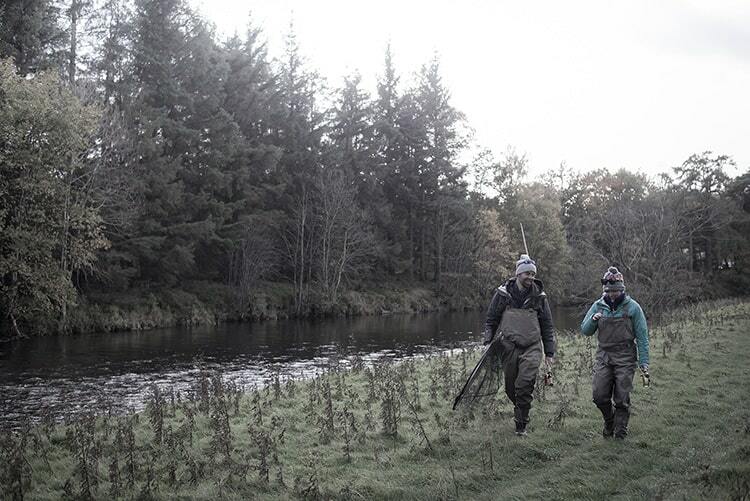 End of day pack up. 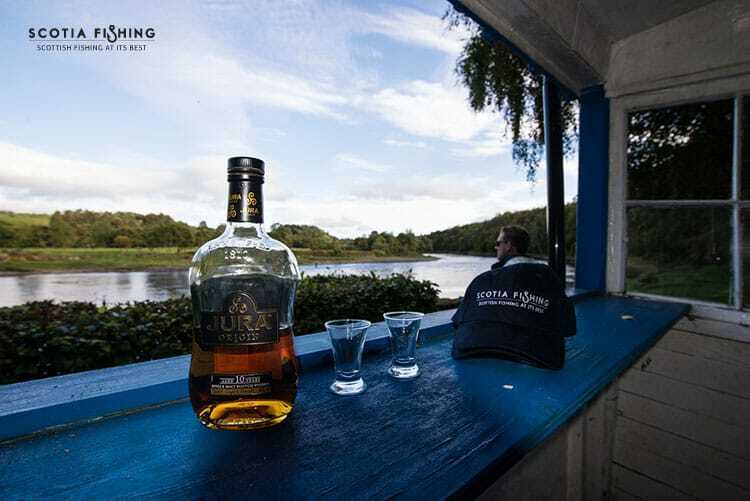 Enjoy a celebratory dram of the finest single malt to toast the day! 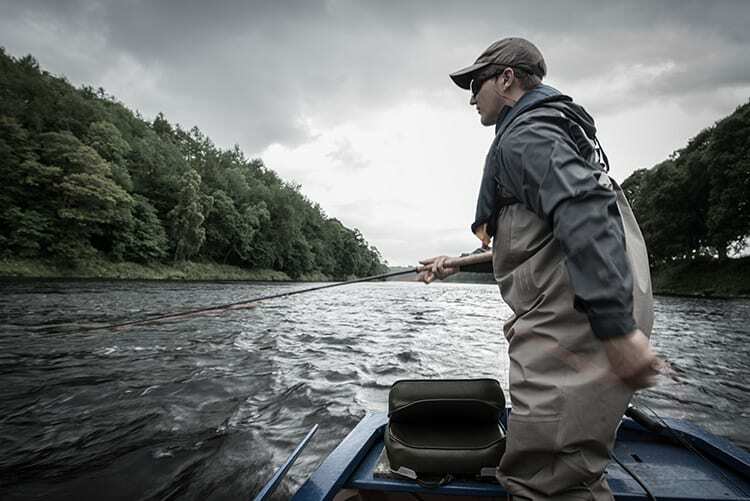 Your guide will drop you back at your hotel after fishing. 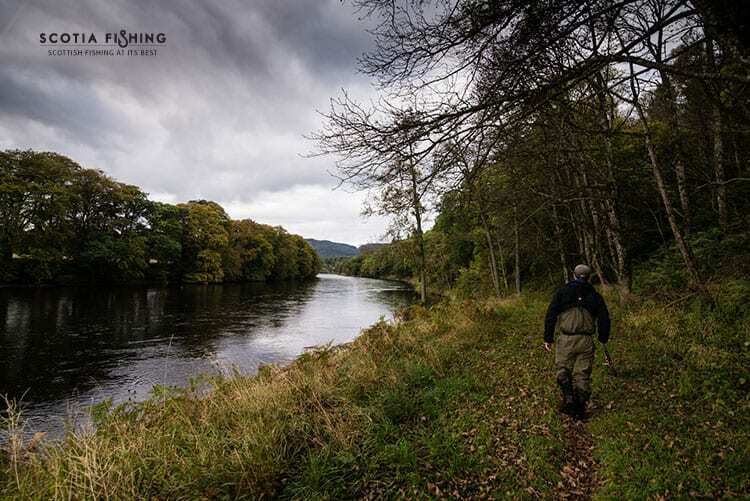 Photographs will be emailed via Dropbox within 7 days of your trip ending along with electronic feedback request. 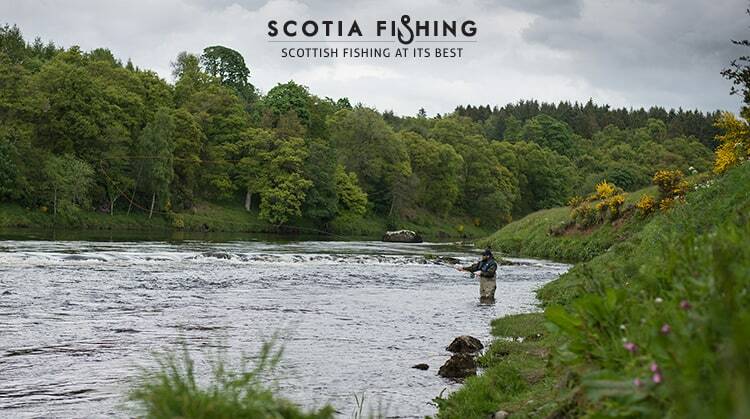 Please note prices will fluctuate according to local weather conditions, peak seasons and permit prices. 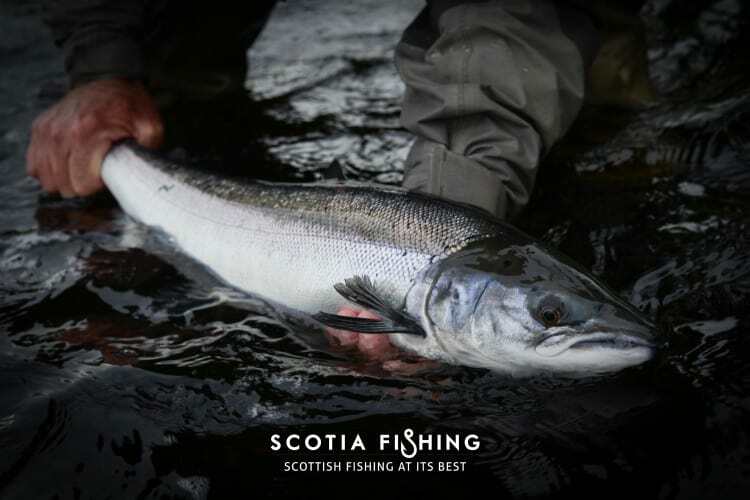 Please enquire for larger groups or further information on guided Salmon fishing trips in Scotland.